Amanda reviewed the highlights of the Officers’ meeting. Lisa gave the treasury report. Amanda listed the upcoming meetings and events. Trini’s logo efforts will be posted and a poll taken to determine the membership’s preference. Rachael announced the next charity block: Jacob’s Ladder, for which there is a tutorial online. Blocks need to be 12 ½ x 12 ½ inches unfinished, with white and another color fabrics. 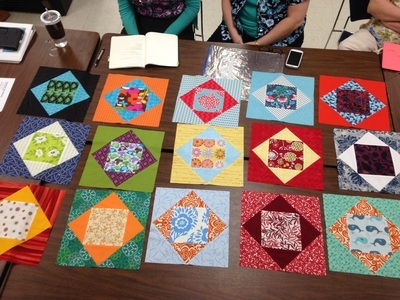 Two suggested quilt designs for the MQG challenge were presented, and the members chose Sunset to be made with purchased fabrics – multi fabrics for each color. Saleemah showed photos of projects for our online auction. There will be four shots of each item on a white background. There were 15 show and tell projects, including some Make It Modern challenges. Amanda demonstrated a procedure for accurate ¼-inch seams. Very informative and easy. Bill, our host at Threaded Needle Too, showed us what happens to grease in our sewing machines. Only LIGHT oil is required. There were 13 members present at Threaded Needle Too, our new meeting place. Amanda gave highlights of the Officers’ meeting and announced that this would be our new meeting place on the third Tuesday of each month. The September Sewing Saturday will be August 26th due to Labor Day. The results of the membership survey regarding the retreat were reviewed. Lisa gave the financial report. Amanda gave Colleen and Bill Backe, owners of Threaded Needle Too, a certificate of thanks for the machine maintenance workshop. We discussed the MQG’s charity quilt challenge and decided to participate. Rachael will start the ball rolling. We discussed the logo project and viewed the progress so far. Lisa will work on implementing our suggestions. Lisa demonstrated several gadgets and tools that she finds useful. The Christmas in July Challenge was issued: make a mug rug (no hanger required) or a mini (no bigger than 18x18) with a hanger with a Christmas or winter theme. Updating PO Box Address with National Guild, the bank, etc. Retreat Survey will remain open until this Thursday, if you haven’t already taken it, please do so before then! When Amanda called the meeting to order there were 10 people present in Room A/B of the HMCPL. We will be meeting here for 6 months. She reviewed the highlights of the Officers’ Meeting. Our retreat is scheduled for March 16, 17, and 18, 2018 at Red Rooster. We have a PO Box: #11342, Huntsville, AL 35814, near Research Park. There were 5 Show and Tells. The Nametag (7 entries) and Color (3 entries) Challenges were revealed tonight. Drawings from participants produced winners, who got prizes. The June, July and August events were reviewed: Sewing Saturdays June 3, July 1 and Aug 5 at the Bailey Cove Library from 9 AM to 5 PM. The Make-It-Modern Challenge was issued; we will take a traditional pattern (handed out tonight) and make it modern. We will make a mini or a mug rug, which is due in August. Upcoming quilt shows and conferences were reviewed. QuiltCon 2019 will be in Nashville, and we agreed to pursue presentation of our “What is Modern Quilting?” there. Lisa produced and presented an excellent overview of features that may make a quilt modern. She had pictures of quilts to show us that exemplified each feature. And she had a handout. Very interesting and thorough. We presented the surprise group-made quilt to Diane for her husband. See pictures elsewhere on line…it was gorgeous, and she was most pleased and grateful. There were 8 members present as Amanda called the meeting to order in the HMCPL. She announced that we were now a beneficiary on Amazon Smile. She gave a retreat report and announced that Red Rooster was our first choice for our next retreat. We will be meeting in the library’s first floor A/B room for the next six months. A motion was made and passed to pay $76 for a PO Box. The nametag challenge reveal will be at the May meeting. The color challenge reveal will also be at the May meeting. We got a new charity block. The Round Robin’s were redistributed. Upcoming events were reviewed. Upcoming quilt conferences and shows were reviewed. There was a drawing for participants in the Twisted Sister block participants, and Cynthia Nail won. We all dumped our scraps on the table and re-collected several each for a scrap challenge. Amanda had us use these to demonstrate an interesting and thorough presentation on the use of value in quilting for our meeting program. Amanda started the meeting in the HMCPL at about 6 PM. There were 10 members present and one guest. Amanda reviewed the officers’ meeting. Our April 11 meeting will also be held in the library as Michaels has other plans for the room we were using. The financial report is posted on line. We are sending 8 people on the retreat to Red Rooster March 24, 25 and 26. Amanda listed upcoming quilt shows in our region. The April 1 Sewing Saturday will be a workshop on paper piecing by Sherry. The April 11 meeting, which will be about 30 minutes longer than usual, will be our scrap challenge. Bring your scraps no smaller than 2/5” and no larger than 10” in at least one dimension. There will be extra scraps. The program will be Value in Quilts. The Sewing Saturday on May 6 will be the charity quilts assembly. The May general meeting is our nametag challenge reveal and our color challenge reveal. Sewing Saturday on June 3 is on open sew. And the June 13 meeting will be the Scrap Challenge reveal. Amanda asked for Demo/Tip volunteers. Someone volunteered to demo AccuQuilt at the April meeting. Amanda will show us how to check the accuracy of your seam allowances in May. And Trina will demo reverse appliqué in June. There were 10 Show and Tell pieces. Amanda gave a fund raising overview: an online auction in Nov/Dec of hangable mini quilts (up to 18x18”) and mug rugs. We had a demo by Sherry of how to bind small pieces. PS Don’t know why the double line appeared or how to remove it. Sorry. Guild Business - Highlights from the officers meeting were shared. Trina has a friend who has volunteered to do the Logo design for free. Committees--If you indicated an interest, you should have received an email. If not and you would like to join a committee contact an officer. Programming - The guild will focus on the top 10 items from the survey results from the spreadsheet handout. Fundraisers - The mini mug rug and holiday auction will be combined. Retreat - Red Rooster Retreat is March 24 - 26, 2017. Deposits of $50 were taken at the meeting. Sewing Saturday is scheduled for the 1st Saturday of each month, currently booked through August at Bailey Cove Library held from 9a-5p. National Guild Updates - ​Links were provided for member for resources and member discounts. Will have a drawing for anyone who gets theirs done by the May meeting but may be completed at any time (See handout for instructions/ideas) If there is enough interest the Guild will look into possibly purchasing pinbacks/magnets. Charity Round Robin - A handout was provided for the Charity Quilt Round Robin Challenge members were encouraged to take a bundle home and bring it back to the next meeting. Demo - Lisa spoke on how to tell fabric content with a burn test, she provided an informational handout and a video link on the guild Facebook page. There were 8 present when the meeting began in Michael’s class room. Amanda reviewed the substance of the Officers’ meeting from January 8. Minutes from that meeting are on Facebook. Sophie resigned as treasurer and Diane will continue to handle the duties until another permanent treasurer can be found. We had Show and Tell from our phone cameras. We each talked about what we are working on. Rachael gave out instructions for the new quarterly charity block, Twisted Sister, which will be posted on our website. Amanda gave us a tip on numbered pins, expensive but invaluable for keeping track of rows and columns of blocks as you sew a quilt top together. Trina graciously volunteered to be our webmaster. December meeting was held at Sam and Gregg's in Madison. There are no minutes as this was not a regular meeting, we held our Christmas gathering. Discussion on drop off of charity quilts for St. Jude in December – Pat was unsure of timing but said anyone interested in helping can contact her via Facebook or call her. She will post the date on Facebook when she knows. Leigh asked about adding a guild label onto the charity quilts and Lisa Cox volunteered to make them. Lisa will post examples on Facebook for input, and will follow up with St. Jude’s to see if there are any restrictions. 2017 Rocket City quilt guild dues will be a reduced fee of $ 20 through December, but after January, the standard (easily pro-rated) fee of $ 24.00 will apply. Discussion on Sewing Saturdays – motion made by Seleemah and seconded Glenn to skip December and January. New administration will decide after that. December meeting place options: Tues Dec 20, 6:30 pm Madison City Hall OR Jo-Ann’s Tues Dec 13 OR Sam and Gregg’s Pizzeria in Madison, available Tues Dec 13. Group voted on Sam and Gregg’s at 5:30 pm to eat, with meeting and activities to follow. Group says yes to Dirty Santa (hand made gift or handy tool with a value of less than $ 10, wrapped in fat quarter). Nominations discussed for November election. With open President position and no volunteers, voting on the position for President is tabled till next month. Question on board responsibilities for each position - Leigh will investigate by-laws and board position responsibilities and get back to the group. Glenn P. volunteered to oversee a Gadget demo, using members gadgets (due to budget restrictions) until more funds are available for actual purchases. Glenn P. also volunteered to oversee a swap of some kind. Details to be discussed in January. Sherry is going to organize a block lottery/fundraiser. Will coordinate with Amanda if it goes into fund raising area. Floor opened up for comments, questions. – Lisa requested if it could it be brought to every Sewing Saturday, in case someone wanted to sew on a charity quilt on their own OR begin cutting blocks together. Lisa will pursue via Facebook. Travel box guidelines reviewed: theme with 1 yard chosen fabric, 1 block done a month, may be pulled out anytime … and we oohed and aahed over all the blocks after we pulled them out all together. Pat shared 7 charity quilts, with another 20 at home. Upcoming Sewing Saturdays - Oct 22, 9 - 5 at Bailey Cove Library. Saturday Nov. 5, 1-5 at Madison Public Library. Amanda brought two quilts to show, 50x60ish, one orange and one green. Sophie brought Glenn's swap box, she did a quilt block with a shoe applique. Pat brought half square triangles for the charity quilts that Deb had made. Sherry brought Diane's swap box, and did a quilt block with paper piecing of tea cups. Glenn brought Sherry's box and did a quilt block with a paper pieced butterfly. Mary was working on placemats. Lee brought a Halloween quilt. Threaded Needle Too discussion of space. Overall positive experience, nice space with tables and a tv for showing webinars, online classes. Threaded needle is open to night meetings, but not on the second Tuesdays. Discussion about 1st and 3rd Tuesdays having conflicts with holidays. Amanda made a suggestion last month to add a fundraiser position. It was asked what we would do with the money. Amanda suggested that we could rent space for meetings, offer prizes, bring in speakers, or offset retreat costs. We have non-profit status tied to the national guild. We can raise money, but not give it directly to members. Also money could be used to draw in more members. Amanda made a motion to create. Sophie seconds. 11/11 vote yes to create Fundraiser Chair position. Pat reminds us we will vote on meeting spaces at the December meeting. Pat went to Quilt by the Lake and suggested a basket raffle as a fundraising idea. Sherry nominates Amanda for Fundraising Chair. Discussion about the November meeting. Options include November 8th at Joann's, Third Thursday at the Municipal Building, 1st Thursday at Lowe Mill. Sherry suggested that YellowHammer has a meeting room, but we don't know if they charge. Straight to Ale has a room, but charges and we don't have funds at this time. Threaded Needle is also an option. A FaceBook Poll was proposed to decide the next meeting location. Amanda will conduct the poll. Sophie will look into Sam & Greg's and YellowHammer, and Sherry will look into Threaded Needle. Diane had penciled us in for November 15th at the Municipal Complex, so it was decided that the next meeting will be at the Madison Municipal Complex and the poll will be for the December meeting. Pat will cancel the November meeting at Joann's. Dues for 2017 are due by the December for a discounted rate of $20, otherwise the rate will be $24. A suggestion was made that fundraising money be used for a PO Box, currently mail goes to the treasurer's house. Pat made a point that the Modern Quilt Guild won't take a PO Box. Sophie did a demo on X-blocks. ​Jennifer, Mary, Leigh, Sherry, Katrina, Barb, Glen C, Lisa, Diane, Sophie, Pat, Deb, Glenn, Rachel R, and A Quilt for Christmas to give away. ​Lisa showed off a pair of Havel's ultimate double curve scissors to show to everyone. ​Sherry - a quilt she started at the retreat and a group of paper pieced hedgehogs and foxes. ​Madison Municipal building has available the 3rd Tuesday from 630-830 No food or beverages are permitted. Deb offered her studio for the 1st Thursdays for meetings and one Saturday a month for Sewing Days. ​The group decided to try out all the different locations over the next few months and decide what to do later. ​Sophie volunteered to demo the x block ruler at the next meeting. ​The Modern Quilt Guild has a tour bus form Feb 23-26 in Savannah GA.
Demo - Jen demoed how to tie dye. ​Charity block - 8 at a time half square triangles, starting with a 10" square, resulting in 8 4 1/2" unfinished blocks. The fabric used can be any that you would like to use. It was suggested that the fabric that was given away at the last meeting could be used for the charity blocks. Deb - update on studio. There are 12 sewing desks, 4 cutting stations, 3 ironing stations. n Attendance: Glenn, Diane, Sherry, Deb, Mary, Sophia, Amanda, Rachel R, and welcome to Kim who visited. New Business: Deb is moving in to her studio at Lowe Mill on Aug 1. She has offered to host Sewing Saturdays for the time being. She also offered to host the meetings however they would need to be moved to Thursday evenings. Due to meetings on Thursday evenings of other local guilds, it would need to be either the 1st or 4th Thursday. The 4th Thursday would have more holiday conflicts than the 1st. It was suggested that we have a charity sewing day on Aug 20 so that members could come and visit the studio to see if they would like to move the meetings to her studio. We will vote to move the meetings from Joann to her studio at a later date. Mary showed off a quilt top she made for the Orlando Modern quilt guild. She also showed a finished quilt for a baby boy. Sherry showed off her heart block that she made for Orlando and a block she made for Glenn's rotating fabric box. Sophie showed off her charity blocks and joined the rotating fabric box! Deb shared that when you are making quick corners for blocks, before you trim them, sew 1/2" away from the original sewing line. When you cut the corner off, you have a half square triangle unit already made. You can collect them to use in the future. Amanda shared that a blogger she follows uses the small 1" hst units for making pin cushions. Aug 20 - anyone willing to host? The members stated they got inspiration from pinterest, instagram, magazines, the internet, facebook, youtube, and pictures of architecture or things seen on trips. Rachel M mentioned the Heart of Dixie is having a quilt show in July. They are accepting submissions. Maria mentioned that the Orlando Modern Quilt Guild is collecting blocks to make quilts for the Orlando shooting. We can make blocks, bring them in to the next meeting and send them in together. Rachel asked if we have a guild historian to update pictures for the website. She volunteered. The members unanimously voted her to be historian. Mary showed three charity blocks she made. Diane showed two shirt quits and her finished Riley Blake quilt challenge entry. Sherry showed a lt blue, white, and gray quilt and a zippered pouch. Glenn showed the charity blocks she made and the block made for Rachel's traveling fabric box. Deb showed the blocks she made for Glenn's traveling fabric box. Sophie showed a quilt she had made for her father. Rachel M showed the block she made for Deb's traveling fabric box. Rachel R showed off a strip for the Lawn Chair Quilt from Moda Bake Shop. Start making strip sets for that quilt and bring them in to upcoming meetings. Please use White or White on White fabrics and whatever other fabric you choose. Remember that we are always needed masculine prints and colors. Rachel M showed off how to do the 6 Minute Circle using freezer paper. Deb showed a quilt that she is fixing for her ex. We were all mortified by the batting which has disintegrated, clumping up, and falling out of the holes. We discussed possible ways to fix the binding. Rachel showed off the block she made for the traveling fabric box. Sherry - star quilt top. a zippered pouch, and a sew together bag. Everyone decided that they'd like to make the sew together bag for a workshop. Recipe of the Month - Pat brought a angel food & crushed pineapple cake that she made and distributed recipes. Tip of the Month - Pat - When you're using multicolor focal fabric, the remaingin materials should be 60% of the primary color, 30% of the secondary color, and 10% of an accent color. That tip came from a Craftsy block of the month. Tip of the Month - Rachel M - Use insulbrite instead of batting in a table runner to make it a long hot pad. It's great for big family dinners and parties. Pat - make a pillow using bits of your favorite fabrics or make small wall hangings out of them to hang in your craft room. Discussion for next month - Where do you go for your quilt ideas and inspiration? Deb showed us how to do the 8 at a time half square triange method and how to trim half square triangles before ironing them, using a ruler the same size as the unfinished block size. Maria showed her scrap quilts, 2 hst quilts, and a strip quilt flimsy and blocks she has been working on. Diane showed her dad's shirt remembrance quilt tops that she has been working on. Pat showed her Missouri Star quilt called Surprise Pinwheels, a purple quilt and a batik quilt. Next year's retreat will be held at the Red Rooster March 24-26, 2017. There is another smaller quilt group that the owners of the Red Rooster are going to try to merge with us so that we can meet the minimum required. Heritage Quilt Guild has open seats on their bus for going to the Paducah quilt show. Please contact their guild for more information. Pat shared a recipe for Skid Row Stroganoff that she has made several times and her family enjoys. May 21 at Pat's or anyone else who would like to volunteer their home. Subjects to Discuss form was passel around for all members to suggest topics for upcoming meetings. Retreat news - Deb - The retreat is Apr 1-3. Jen, Deb, Rachel R, Sherry, and Diane are planning to attend. Carol showed how to line up fabric before cutting so that you don't get the bump when you cut. She also says that she cuts out patterns from magazines and stores them in binders. Rachel M says that Creative Grids rulers are awesome. Sherry use garden gloves for quilting. Cut the index finger and thumb off the gloves so you can change bobbins, etc while quilting. Proposal - Diane - change dues to $24 a year so we can prorate new members easier. Returning members can renew for $20 if paid by the November meeting. The national guild requires us to renew in December. *Deb is still waiting to hear back from Lowe Mill. If she is granted studio space, Sewing Saturdays will have a home there. Pat did an experiment starching fabric before cutting. She showed samples of fabric using 1/3 liquid starch & 2/3 water and 1/2 starch & 1/2 water. The 1/2 water had a much nicer outcome when cutting. She also showed off using and empty parmesan cheese container to put yarn or ribbon in for couching. The yarn/ribbon would come up through one of the holes in the shaker container. Rachel M showed off a diy portable design wall that she hangs using cup hooks on the wall. Rachel demo'ed how to do a disappearing 9 patch block which will be the new charity block of the month. Vote - Should we do the show and tell portion of the program in the beginning, end or in the middle? The middle won. Charity Quilt Drop Off - 29 quilts were dropped off at St. Judes on Dec 22nd. They were very grateful! Who is planning to go to the retreat? Rachel, Glenn, Sherry, Yvette, Jen and Deb. There are not enough people planning to attend to meet our minimum. A vote was held and approved to open it up to the Madison Station Quilt Guild. National Guild Renewal - Deb will pay then be reimbursed by the guild. Sewing Saturdays - Will be held at member's houses until a new location has been found. Both Deb and Pat volunteered their homes. Deb is trying to get studio space at Lowe Mill. If she is successful, we will be able to have our Sewing Saturdays at Lowe Mill, as well as the meetings but the meetings would need to be moved to Thursday nights. Yvette - batik drunkards path top, French braid and tree quilt, browns wonky top, Asian cranes wonky top, geisha wonky top, 2 different koi tops, Irises top, and small table topper tops to match the other tops. Upcoming Charity Blocks - Rachel R will take over picking charity blocks. She does not have room for the charity fabric though. Would anyone be interested in beginning a Tip of the Month? It would be a quick tidbit to share with the group. There was not enough interest to begin this. Recipe of the month? There was not enough interest to begin this. Demo - Pat showed how to do matchine applique using solvy washable paper solvy and a glue stick. Library Quilts - We do not have enough quilts to continue to display at the library. The Madison Station Quilters may take it over. They will vote on it at their next meeting. Update - the Madison Station Quilters decided to not take it over. Deb will contact the library and inform them that the program will need to be ended. Dec 8 - Holiday Party Meeting! Challenge Quilt Projects are due! Please bring a food item to share and a small sewn gift wrapped in a fat quarter if you would like to participate in the gift exchange. There are no longer tables in the room we use for sewing Saturday's. Please consider bringing a folding table to use. The current cost is $195. The retreat is open to guild members. You can invite friends & family to attend. They do not need to be quilters. Spots will be given to guild members first however there so most likely be enough space for others to attend. Madison Station Quilters would like some seasonal quilts from our Guild to hang for the Christmas Library Display. RCMQG will display quilts at the Library after the 1st of the year. The Christmas Tree will be decorated the Saturday after Thanksgiving. we used the tables in the room across the hall as well as the desk in the room. It wasn’t too bad. I do suggest people try to do the bulk of their cutting out for projects at home. Guild board member elections are coming up very soon. Please consider running for a position. It does not have to take a lot of time to do. If you would like to volunteer, please do so, especially for President. Deb has been doing it for several years and would like to step down if someone will step up. It truly doesn’t take that much time to write the agenda, make sure the demos are all squared away, and run the meetings. She has also been the library liaison and can continue to do so if need be. Other board position are Vice President, Treasurer and Secretary. ​Don't forget that the Challenge Quilt project is due at the December meeting. Please consider bringing a folding table to use. At the last Sewing Saturday we used the tables in the room across the hall as well as the desk in the room. I do suggest people try to do the bulk of their cutting out for projects at home. Bags of fabric were distributed for our guild challenge. The fabrics were grouped into categories and then we drew for bags. This is going to be a fun challenge. It's not too late to participate we did have some bags left. you are welcome to make more than one and or/to sandwich and complete the quilt. Carol is trying to start a neighborhood group of The American Sewing Guild. Meeting are held 2nd and 4th Wednesday's at Joann's from 6-8. Carol shared a cell phone cozy and some pot holders that are class projects. She kits up the projects for the meetings. Who is interested in carpooling for this show? Which day would you like to go? No demo this month. We were contacted by Caroline Chesebrough who met with Pat to donate several boxes of fabric and other crafty items for the guild and its members to use. We went through the the boxes as a quilt to organize them. Please consider volunteering for a demo. Library quilt is a bookshelf quilt - bring in assorted strips of fabric scraps. Black background so the strips should be bright and light colors. For the houses quilt, we’ll need random green squares/strips/etc for the grass as well as random light blues for the sky. We can even assemble different light blue blocks into the sky or green blocks for the grassy areas. We currently do not have enough house blocks to make the house quilt. We need more house blocks. The next library quilt change will be the beginning of August. Madison Station Quilt Guild will be hanging this time. We will do a joint display for November and December. Demo by Diane - Diane demonstrated how to use wood, rulers, magazines to get flat seams. The wood did the best job. She also demonstrated how to use the wood to get rid of pressing mistakes. We would like to make some new ornaments for the tree this year. Please make an ornament or two each month to decorate the tree. We can start a Pinterest board for quick yet attractive ornament ideas and begin in July. We will also need an artificial tree to use and Diane is checking to see if we can use one of here's. The retreat is open to guild members. You can invite friends & family to attend. They do not need to be quilters. Spots will be given to guild members first however there so most likely be enough space for others to attend. Deb won the door prized and has volunteered to provide the door prize for the next meeting. UAH is closed on weekends until the beginning of August. bring in assorted strips of fabric scraps. black background so the strips should be bright and light colors. We'll need random light blues for the sky. We can even assemble different light blue blocks into the sky or green blocks for the grassy areas. We currently do not have enough house blocks to make the house quilt. The next library quilt change will be the beginning of August. We need to coordinate with Roland (Pat’s husband) and the library to do the change out. The Guild voted in favor of offering the library quilt display to other local guilds. If the other guilds are interested, we could alternate quilt displays with them. An idea is to have each guild have a quarter and do a combined Christmas display. We display about 20 quilts each time. Deb can contact the other guilds in the area to see if they'd like to have an opportunity to showcase their guild. Pat has made a display of How a Quilt is Made to decorate library display window. Deb has volunteered to set up the display on July 1 and remove it on July 31. We will also need an artificial tree to use and Diane may be able to provide a tree. Jan won the door prized and has volunteered to provide the door prize for the next meeting. Library Quilt Assembly Day - a bookshelf quilt - Please go through your scrap fabric and bring in assorted strips of fabric scraps. We will do a black background for the quilts and possibly brown strips of fabric to create the bookcase. The strips should be bright and light colors. For the houses quilt, we’ll need random green squares/strips/etc for the grass as well as random whites for the sky. The charity quilts that were just taken down from the library will need to be washed then delivered to St. Judes. Diane and Pat will deliver the quilts to St Judes. We have the window display the library for July. It will need to be assembled on July 1 and removed on July 31 or first thing Aug 1. Pat and Deb talked about it while hanging the quilts this past time and thought how cool would it be to do a quilt from start to finish - showing fabric, then assembled blocks, then blocks sewn in to strips, then a quilt sandwich, then a finished quilt. The quilt(s) would be charity quilts when completed. We will need a bunch of blocks to pull it off but it would be a really cool display. We all loved Crystal's Stacked Squares quilt and talked about doing that block for a future charity block. More details to come at the next meeting. Next year’s retreat will be April 1-3 at the Red Rooster. The current cost is currently $195. Minimum for Red Rooster - 12-23 people. Please extend the invite to friends and family, whether they quilt, scrapbook, paint, needlework, etc. The Rooster has been sold however the new owners want to continue with the retreats, exactly as they are currently being held. The new owners are from New Orleans so possibly expect a cajun twist to the meals. Demo - Deb - how to clean an iron using a knock off Magic Eraser called Scrub Buddies purchased at the Dollar Tree. It cleaned two of Pat's really dirty irons to look like new! Diane suggested that after cleaning the bottom, you heat the iron and rub it on waxed paper for a gliding surface. The Scrub Buddies can be found in the kitchen area of Dollar Tree, near the sponges and gloves. The Strips and Curves Workshop will be rescheduled, we discussed breaking this into two Sewing Saturday's. One for piecing the strips and one for the curves. Library Quilt Assembly Day - a bookshelf quilt - bring in assorted strips of fabric scraps. We are using black for the background so choose brightly colored scraps. For the houses quilt, we’ll need random green squares/strips/etc for the grass as well as random light blues for the sky. We can even assemble different light blue blocks to encorporate in to the sky or green blocks for the grassy areas. The next library quilt change will be by the end of the month. We need to coordinate with Roland (Pat’s husband) and the library to do the change out. The charity quilts that are currently on display will need to be washed then delivered to St. Jude's. We still need volunteers to deliver the quilts. We decided to do door prizes at our the Charity Quilt and Library Quilt Assembly Day. We discussed having door prizes at our monthly meeting. Members can donate ufos, unused but new notions or books. The guild can purchase door prizes for meetings and charity sewing days. Members can donate a dollar at meetings for door prizes. Some guilds do block drawings. Everyone makes a specific block and turns them in. The winner gets all of the blocks to do something with. Choose a theme - stars, nine patch, curves, houses etc. Bring a small journal that will stay with your fabric. In that journal write a little something about what you would like to see in your blocks. We will swap fabric and journals at the meeting, you will make one 12.5 unfinished size block or four 6.5 blocks as long as it will finish into a 12 inch block adding fabric from your stash and write in the journal about the block you made. If you can't make the next meeting make another different block for your person for the month you missed. Bring your block and fabric and journal you worked on to swap at the next meeting. demoed a method for joining binding that uses no math. We need volunteers to do demos at the meetings. We took the remaining balances due for the retreat. We discussed pairing like sleepers together. Sewing Saturdays *should* be in room 204, unless it is taken by a class. We are taking donations of wonky houses and trees for a quilt to be made to benefit the library. We would like the blocks made with a white or a white on white background. The color and size of the houses are up to you. Have fun with them! There are lots of tutorials online on how to make wonky houses. A second quilt for the Library - a bookshelf quilt was suggested. We can assemble this on a Sewing Saturday, using white backgrounds and strips of solids/reads as solid materials. It would be very appropriate for a library quilt. The quilts hanging will be swapped out for new ones the first or second week in April. Please consider loaning a quilt or two to be displayed. Repeats are always accepted as well. If you would like to sell a quilt, the library suggests a 20% donation if it sells. Several message have been left with the St. Judes Charity Quilt Contact. None have been returned at this time. How many quilts are on hand? Are skull prints acceptable for older kid sized quilts? We discussed pitching a book of original designs and clever ideas to solve quilting problems. Examples for projects were mug rugs, lap quilts, placemats. Deb showed examples of fabric and rulers to use for the Stack and Whack workshop. It was suggested to google Bethany Reynolds to familiarize yourself with the process. Deb showed how to audition fabric using 2 mirrors. Pat demoed our new charity block based on the oriental garden block. and she showed several examples of the block that she had made and she provided a handout with instructions. We took deposits for the retreat. Feb 21 - Ginormous Tote Workshop Please print off or have the tutorial on your phone/tablet. We will not be distributing the tutorial. The designer is excited that we are doing her tote as a sew along and hopes to see pictures of finished totes. She said the longest time will be doing the quilting. Please have your blocks/tote fabric created before you come or else you won’t finish in one day! Deb is going to contact St Judes to find out exact sizes requested as well as if skull fabrics can be used for quilts since they are so popular right now. We are girl fabric heavy. Please consider making some boyish quilt blocks if possible. Missouri Star has a skateboard quilt that would be great for boy fabrics. White or white on white backgrounds are great. The current block would also be great in more masculine prints. A representative from the MSQ contacted is to see if anyone in our guild would be to come to their March 12 meeting to give a talk on what is modern quilting and show off some quilts if possible. Nobody stepped forward to give a talk. We hope to be invited to do this in the future. The guild was contacted tonight about a Project Linus mystery quilt/contest/fundraiser. Information can be found here http://www.projectlinus.org/lukey/ for those that are interested. It costs $15 to participate. It is a mystery quilt do no info about what kind of quilt it will be is unknown. There are cash/product prizes. 3 tops using drunkard path blocks. One was abstract animals and two are charity quilt tops. Sherry demoed a method for creating Drunkards Path blocks using the Circle Savvy ruler with very little waste and Deb shared a tip for sewing them together accurately. Deb's No More Tricky Triangles pattern. Deb is going to post videos tutorials on her website. We plan to display the finished quilts at the library. Instructions were provided for making two different sized blocks a 4.5 square and 8.5 square. It is requested that white on white (no cream) be used for the white strips. Please make the blocks for either a boy or a girl but don't mix the two in the same block. Jan contacted St. Judes about quilt colors. They have requested no black, gray or other non cheery colors. Block can be any size. Make sure background is white or white on white fabric. We also spoke of making a quilt to be sold and the profits go to the guild to buy batting and solid colors for making charity quilts. A theme was not decided. We will work on the house quilt first. If you see a quilt that you feel would be great for this, please share it with the guild. Minimum of 6 people, max is 14. It looks like there is enough people interested to meet the minimum. Cost - $195 per person. Deposit is due by the next meeting and the remaining balance is due at time of retreat. Member deposits should be made payable to the guild or in cash. Hotels in Paducah are most likely expensive and sold out. Last year we stayed at the Econo Lodge at 2184 US Highway 62, Gilbertsville, KY. It was about 20 minutes outside of Paducah, was affordable and clean. The hotel is $150 plus tax per night, based on 4 adults. From experience, the show is more enjoyable and less crowded on Saturday however if you want to shop, a lot of the vendors are sold out on the most popular items but they usually offer to ship for free. Last year we left Friday and returned Sunday. If you want to go try and gather a group of 4 and book hotel ASAP. Patsy demoed a beautiful tiny foundation pieced block pattern from George Siciliano. The block consisted of a black background and a gradient selection of fabrics. A rainbow gradient could also be used. She also demoed rulers designed for trimming paper pieced seam allowances. Voted yes to buy a roll of batting and a bolt of Kona white for charity quilts. After the November meeting, elections were held via internet for board members. Glenn Pettaway was elected Treasurer. Deb Richey was elected President. Pat Brooks was elected Vice President. Sherri Kirkham was elected Secretary. The December meeting was a year end party. No business was held that day. Deb also showed a strip of LED lights from Inspired LED. They can be attached to the throat of the machine and provide excellent additional light (way better than lamps etc.). The strips are 21" long for $30, but for an extra $15 ($45 total) you get an extra power source so the strip can be divided and used in two different machines (great if you wanted to get with a buddy to purchase). The lights also last a really long time. Pat was very busy and showed 9 projects! Very modern quilt with lots of negative space called Ready, Set, Go! made from the reds in the donated charity fabric. A bunch of Christmas ornaments for the tree and the start of a white yo-yo garland. Pat has invited everyone to help make white yo-yos to add for the Christmas tree decorations. Dec 9- Christmas party- bring something yummy to share and a small sewn item (doesn’t have to be quilted) for our gift exchange. Gift should be wrapped in a fat quarter. December 1 Will be the library Christmas tree decorating. Coordinate with Deb Richey if you can help. March 13-15, 2015- Guild Quilting Retreat at the Snowbird- The price is $175. There is a minimum of 6 people to attend. A deposit is due after the new year. The officer positions will be coming up for vote in November. They are President, Vice President, Secretary and Treasurer. None of these positions takes much time and you can self nominate. Please consider taking an active role in the guild. There have only been a few officers (the same folks each time) for the last few years. Please contact an officer if you would like to have an officer position. Additional committee chairs also available (charity blocks, challenge, photographer, etc). Lisa’s quilt is on a Redstone Federal Credit Union commercial- click here to watch it. Library Update – Quilts are down at the moment. Previous contact has left the library. Quilts will start being hung again in January. Patrons and library staff are loving the quilts – they get lots of compliments on it and we get lots of PR. There are about 15-20 quilts at a time. A vote was held to see if charity quilts should be used for the library quilt display and it was unanimous that hanging charity quilts was acceptable. It gives the charity and our guild positive exposure. Library has told Deb we'll get a good spot for our tree this year. Charity Quilt Block Update – Our current block is the Economy block. Click on “Current Charity Block” link for instructions for making the 12” finished size blocks. There are two links, one for calculating various sizes and one just for 12” blocks. Please bring your blocks in when you have them made. Charity Quilts- 14 quilts were donated on August 28th to the St Jude’s childrens cancer clinic. They were so well received and very grateful to have these to hand out to the children. Our next charity quilt assembly day will be in January 2015. It’s a fun day of group creativity not to be missed! Click on the "Charity Quilts" link on the home page for pictures. Click here for more information about the clinic. Demo- Deb showed how to hang a quilt flush with the wall and without a hanging sleeve. After investigating Magnificient quilt co. hangers that were too expensive, Deb came up with her own solution. · Slide rod through the saftey pins. If quilt top is long enough, you may need double the rod which is why 1/16" is important because 1/8" wouldn't fit doubled up. · Make sure the rods are inside the safety pins and tape the overlap of the rods in at least two spots (Deb just used regular scotch tape). Christmas Challenge: We will be making a small quilted Christmas item for our gift exchange in December like placemats, coasters, ornaments, wall hangings, etc. In Attendance: Jan, Karen, Amanda, Debbie, Sherrie, Lisa, Pat, Rachel and welcome visitors, Jeannine, Patsy and Lori! Sherry showed her “Quiet Quilt” made from pastel neutrals. Pat showed her Tetris quilt made from the charm squares she won from the guild challenge. Nov 11- This is Veterans Day- we need to find out if the room is available this day. November meeting- officer elections. Dec 9- Christmas party- bring something yummy to share and a small quilted item for our gift exchange. If you are interested in entering a quilt in the Quiltcon show, registration is open now until November 1, 2014. Did you know that there are free quilt patterns available as well as free webinars under resources? Charity Quilt Block Update – Our current block is the Economy block. Click on “Current Charity Block” link for instructions for making the 12” finished size blocks. There are two links, one for calculating various sizes and one just for 12” blocks. Please bring your blocks in when you have them made. We now have more than 29 blocks made! We discussed making a “raffle” quilt in order to raise money for our charity quilt supplies. Several ideas were discussed on how to do this. Lisa is going to check with the St Judes clinic to see if they can assist with this. Lisa donated $100 to the guild to buy charity quilt supplies. This was the fee that was paid to her by the company that used her quilt in the commercial. Demo- Jan showed her technique called Padded Quilting. It’s when you layer your quilt top and quilt back without the batting. You start your quilting in the middle of the quilt and “stuff” the areas of quilting with bits of batting or yarn. You can also start with quilt top, batting, quilt back and add batting or yarn to your quilting areas. It has a nice puffy effect similar to trapunto. Guild Challenge - Due at the October meeting - take a traditional quilt block and modernize it by cutting, shuffling and reassembling it. All blocks created can be donated to the charity quilt block stash if you like. Even if you feel it is unsuccessful please bring it to share so we can all learn from your experimenting! In Attendance: Sarah, Amanda, Jan, Karen, Jen, Rachel, Jeanette, Elaine, Lisa, Sherry and welcome to Carol, Debbie and Glenn. Pat- An orange and blue child's quilt, A space fabric themed quilt made from Economy blocks for charity, 2 modern pattern with solids for charity, 2 rainbow slice quilts for charity and a Wonky block quilt for charity. Sarah showed a baby quilt made from blue fabrics with appliqued cars; a wall hanging quilt and an embroidery project that is a cell. We talked of adding an extra sewing Saturday(s) before Christmas- we will check to see if the room is available. The MQG challenges were due July 25th and looked wonderful. Unfortunately, no one from our guild won. Deb has stepped down as president of the guild due to her duties as band mom. Thank you to Deb for starting the guild and bringing it to where it is today and being president for 3 years. Karen (vice president) will take over until November when we have our elections for next year’s officers. The officer positions are President, Vice President, Secretary and Treasurer. None of these positions takes much time and you can self nominate. Please consider taking an active role in the guild. There have only been a few officers (the same folks each time) for the last few years. Library Update- The last change out was at the beginning of this month. There is great feedback from the public about the quilts. The next change out day will be the beginning of November for Christmas quilts and early January to take down the Christmas quilts and hang new ones. If you haven't yet loaned a quilt for display, please consider it. It's a great way to share our beloved art/craft with the public and brighten our library. *note- we will not advertise any quilts for sale right now d/t apparent conflict with our 501(c)3 charity status. Someone will be looking into this for final clarification. Library Window Display- Thanks to all that loaned small items for the library window. It was a huge success and looked fabulous! We are scheduled to decorate the window again in July 2015. Charity Quilt Block Update – Our new block is the Economy block. This is the block Elaine demoed in April. Click on “Current Charity Block” link for instructions for making the 12” finished size blocks. There are two links, one for calculating various sizes and one just for 12” blocks. Please bring your blocks in when you have them made. The last charity quilt top assembly day was great creative fun and we have one coming up again in the near future. Charity Quilts- We have 9 finished charity quilts! And two to be finished in the next couple of weeks. They all look wonderful and so well suited for the children at St Jude’s cancer clinic here in Huntsville. A giant thank you to Pat for quilting and finishing 6 of them and a few she made entirely herself. Deb contributed 2; one she made entirely herself and another group quilt that she quilted and Lisa quilted and finished one and 2 were quilted by Jen (and are out for binding now). What a great effort from everyone from beginning to end. When the last two are finished, I will bring them to the child life specialist at St Jude’s. Demo- Karen showed several image transfer techniques. Image transfer pen called the “Ultimate Marking Pencil” by Hancy that is a light color with the texture of a crayon that marks very well on darker fabrics and comes off with ironing. Pounce Pad- this is a chalk holder of sorts that you smooth over your stencil to leave the marks on your darker fabrics. It stays on quite well when you are quilting and comes off easily in the wash.
Sulky water soluble stabilizer- This is quite well suited for use in stabilizing your embroidery projects. You can also draw on it, glue stick it to your fabric and use it as a template for your designs. It is made of polyvinyl alcohol (same stuff as detergent pods) and easily dissolves in water when you are done. Graphite papers- Place these on your fabric and place your image you want to transfer on top and trace. They come in dark (graphite color) and in white. Find these in the art section of a craft store. The marks come out with washing. In Attendance: Amanda, Jan, Lisa, Deb, Pat, Sarah, Diane, Sherry, Heather, Elaine, Jen. A big welcome to our new members Sarah, Diane and Sherry! Deb- Butterfly quilt for charity, a star quilt made with the creative grids scrap crazy 6” ruler, her City Scapes quilt top, and her Michael Miller fabric challenge quilt that looks like Chinese lanterns. Lisa showed a picture of a One Block Wonder quilt in progress. Pat showed her completed Geometric Shapes quilt, her butterfly quilt, her half-square triangle purple wall hanging, her Michael Miller fabric challenge wall hanging and her batik quilt she made from the scrap crazy 6” ruler. Jen showed her completed double sided quilt made from a purchased quilt top and Hawaiian fabric pieced back and her completed “pizza box quilt” that was started a few years ago. Modern Quilt Guild Challenge- Due July 25th. Remember that your item has to be quilted. It can be anything, but must be quilted. Winners will be announced Aug 8th. Karen will bring her camera to the July 19th sewing Saturday for those that would like their projects photographed. Library Update- Next hang dates: Beginning of August, beginning of November for Christmas quilts and early January to take down the Christmas quilts and hang new ones. No Halloween quilts. If you haven't yet loaned a quilt for display, please consider it. It's a great way to share our beloved art/craft with the public and brighten our library. You can also put your quilt for sale with 20% of the proceeds going to the library. Library Window Display- those that loaned items for the library display window will be returned at the August meeting and Aug 9th Sewing Saturday. Elaine's Economy block quilt made with batiks. Please bring your blocks in when you have them made. If you have a charity quilt you are working on, please finish them so we can make our first donation to St Jude's here in Huntsville. Demo- Deb demoed her disappearing hourglass quilt block made by taking a pinwheel block, cutting in along each edge and rearranging for a secondary pattern that is a star. Challenge - Due at the October meeting - take a traditional quilt block and modernize it by cutting, shuffling and reassembling it. All blocks created can be donated to the charity quilt block stash if you like. Even if you feel it is unsuccessful please bring it to share so we can all learn from your experimenting! Christmas Challenge- Bring in one yard of a Christmas fabric you really like to Augusts' meeting. We will show our yards then take them home to make something Christmasy from it (that can be used for a gift at our Christmas meeting). Please bring some ideas, pictures or patterns to share for inspiration. Deb showed her scrappy crazy ruler quilt of Stars on Yellows, her City scapes quilt top, her Dalek cross stitch pattern quilt made from 1 ¾ inch squares and her quilted Urban Nine patch quilt with the Urban Neighborhood pattern on the back. Lisa showed her completed T-shirt quilt, two quilts made with Kaffe Fassett fabrics and from the same modern pattern, and a baby quilt made with brights and polka dots that is for sale. Elaine showed her quilted layer cake quilt called confetti and her quilted Economy block quilt. Any suggestions on workshops or quilt alongs you would like to do? Is there anyone who would like to run a workshop or quilt along? Modern Quilt Guild Challenge- Due July 25th. Remember that your item has to be quilted. It can be anything, but must be quilted. Winners will be announced Aug 8th. Karen will take professional photos on July 19. Jen’s Ugly Fabric Challenge- Pat made a wonderful totebag from a pattern she designed herself and Lisa made an optical illusion quilted wall hanging. Both “won” a brights fabric layer cake stack from Jen. Next hang dates: August 1st, Beginning of November for Christmas quilts and early January to take down the Christmas quilts and hang new ones. The library has requested no Halloween quilts since they will be hanging Aug - Oct. For the November quilt change, Christmas or winter holiday quilts would be great. Please lend your quilts to be displayed. Remember that quilts can also be sold there with 20% going to the library. Here is a picture of the Bird Quilt we made that is hanging in the library for sale to fund our charity quilts. Library Window Display- June’s window display is up and looks great. Thank you to all who loaned your small quilted items. We have the month of July so please see what you else you might have to put in the window and get them to Deb by the end of June. Charity Quilt Block Update – Our current block is the Wonky Diamond block. The tutorial is on the facebook page and on our website. Please bring your blocks in when you have them made. St Jude’s Children’s clinic will be receiving our charity quilts which there are around 13 or so that are being finished. There are mostly just toddlers (2 and under) and teens that are current patients so we have adjusted the quilt sizes to fit this (45” x 45” and (45” x 60”). Once we get them all finished, we will deliver them to the clinic and leave them with the Child Life Coordinator, Beth Daniel to distribute. We only have 3 completed quilts right now. For those that have quilt tops out there, please finish them and we still need volunteers to take home a quilt top or two to finish. Please contact Amanda or Lisa. We have another Charity Quilt top assembly day loosely scheduled for January 2015. It was a fun day so plan on coming out to the next one. Fabric Craft Sale- Deb discussed this possibility of working with Kids Market (which is a consignment shop) to sell our fabric that we no longer want. May 24th- Open sew with emphasis on small projects to go in the library window. June 28 - *bumped forward due to July 4th. Strips and Curves available with Jan.
Modern Quilt Guild Challenge- Due July 25th. Remember that your item has to be quilted. It can be anything, but must be quilted. Winners will be announced Aug 8th. Jen’s Ugly Fabric Challenge- We need to have something made from it, preferably quilted, and it’s due at the June meeting. There will be two categories- “Everyone’s Favorite” and the “Most Modern”. Dye Day - Taught by Jen is canceled due to date conflicts. Decide on a day in the fall and have everyone put it on their calendar. Karen and Jen will attempt to reschedule in fall. The Chattanooga guild contacted us after their last meeting and said that they are confident they will be able to join us at the Grand Oaks. At the March meeting, the majority decided that the Grand Oaks was preferred over the Snowbird. It was more comfortable, has great food and is closer. Once a group gets the week/time slot, it remains their week/time slot until they no longer wish to go there. We may not get another chance at getting a week because of that. Most groups continue to go there every year so vacancies rarely open. We can have the weekend of March 13-15. The price is $210 with meals included- check-in on Friday afternoon and checkout Sunday afternoon. The Snowbird is currently available March 21-23, Jan 3-5, 10-12 and 17-19. The price is $175. There is a minimum of 6 people to attend. Vote on which location -This is a big decision for our guild. Should absentee votes be included? Attending members voted to set up a Facebook Poll to decide this. Library Update- We now have our ladder at the library so we will be able to hang the quilts ourselves. Next hang dates: Beginning of August, Beginning of November for Christmas quilts and early January to take down the Christmas quilts and hang new ones. The library has requested no Halloween quilts since they will be hanging Aug - Oct. Halloween would look out of place in August and September. For the November quilt change, Christmas or winter holiday quilts will be gladly accepted and encouraged. Please lend your quilts to be displayed. Remember that quilts can also be sold there. We currently have 6 quilts that are for sale right now. Library Window Display- We have the months of June and July to show our small quilted items like bags, baskets, pot holders, small wall hangings, placemats, etc. Be thinking about what you can share. Deb needs these items in late May, before the beginning of June. If there is not enough to display in the window for June, she can fill it with crocheted items and we can display in July. Volunteers to quilt/bind assembled tops? Those that were present requested doing it again. When is a good date to do that? Some quantity of donated fabric should be made available at Open Sew days for those wishing to work on charity block. Using donated fabric for workshops, in which everyone builds a block during the workshop then the finished blocks can all go together to make a quilt since they will be made with matching fabrics. Renewing our membership in the MQG will be $250 due in January (for 16-25 members, we currently have 18 paid members, at 26 it bumps to $400). MQG officers will investigate proposed option C to compare to options A and B and the guild will vote again. Demo sign ups- June- Lael; July- Deb; August-Karen; September- Jan; October- Amanda; and November is open. Iron background fabric RIGHT sides together. Iron sliver fabric WRONG sides together. Place your sliver in the crease of you background fabric and sew a ¼” seam along the crease to attach your sliver. Cut your squares 1.5” larger than your desired finish block size. You’ll lose a little with each seam and you can always trim down the extra. Cut your slivers a little longer than your background fabric to hold them in place more easily during sewing. If you’re going to use your slivers to frame a contrasting fabric in the center, be sure the slivers are wide enough to cover the edges of you fabric insert for topstitching. Elaine showed her completed Celtic Sherbet quilt and her unique Fibonacci Quilt that is being used in her math classes at school. Vicki showed her Spider Web string quilt in progress and a quilt top she is making out of her husbands clothing. May 3rd- Charity Quilt assembly day- Please bring fabric you might like to donate for quilt backings and also white fabric (like Kona) to add as sashings, etc. May 17th- TENTATIVE- Dye day at Karen’s house- Jen will be teaching the technique and gathering the supplies for us. She will need to know how many yards of fabric you want to dye. Quilting Retreat for next year- We voted on going to the Snowbird. Our first choice of dates is March 7-8 and second choice is Feb 19-22, 2015. We need a minimum of 6 people. Prices are $85 for 2 days/1 night; $175 for 3 days/ 2 nights; $245 for 4 days/ 3 nights. There is some flexibility- you could come for some or all of it. Modern Quilt Guild Challenge- Deb has the fabric for those participating. She will have it at the next sewing Saturday on April 12th. Library Update- Please bring your quilt(s) for display! It has been well received in the library and what a great way to share our craft and art with the community. Please fill out the information form located on the facebook page so that we have accurate info about your quilt(s). If you have pictures of it, email to Deb. The next hang date will be May 1st and help is needed at 8 AM in the library- contact Deb. If you would like to put your quilt up for sale, the fee for the library is 20% of the sales price. We now have our ladder at the library so we will be able to hang the quilts ourselves. Next hang dates: Beginning of August, Beginning of November for Christmas quilts and early January to take down the Christmas quilts and hang new ones. The library has requested no Halloween quilts. Library Window Display- We have the months of June and July to show our small quilted items like bags, baskets, pot holders, small wall hangings, placemats, etc. Be thinking about what you can share. Deb needs these items in late May, before the beginning of June. 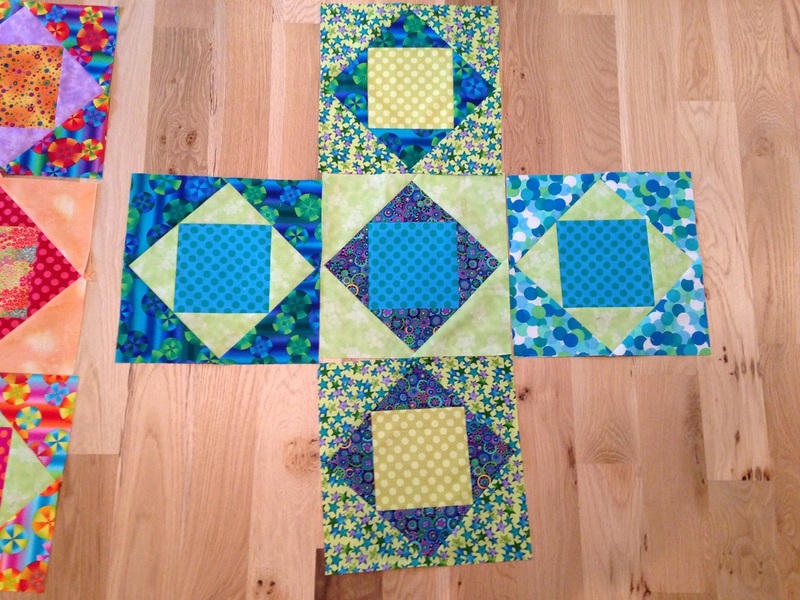 Charity Quilt Block Update – Our current block is the Wonky Diamond block. The tutorial is on the facebook page and on our website. Please bring your blocks in when you have them made. Lisa is checking into possibly donating our quilts to the Huntsville Children’s Hospital. Demo sign ups- May- Pat; June- Lael; July- Deb; August-Karen; September- Jan; October- Amanda; and November is open. Rotary cutting blades- Deb will be placing an order for 45mm rotary cutting blades bought in bulk and costing about $1 apiece. If you want to buy some, she will sell them to you in packs of 10. Contact Deb. Demo- Elaine showed her Economy Block that she designed using only charm squares. Several block sizes were presented on her tutorial sheet with directions for a layer cake size as well. Note: February’s meeting was cancelled due to inclement weather. It was cold and icy. In Attendance: Deb, Heather, Jeanette, Rachel, Amanda, Lisa, Jen, Pat, Lael, Elaine and Jan.
Elaine showed her batik charm square “Economy Block” made entirely from charm squares; Debbie Caffrey’s Buzz Saw pattern made from red, white and blue jelly rolls; Her inspired small quilt called “It’s Loud in Here” and her Oakshot cotton quilt made from a fat quarter stack she ordered from the UK. Jeannette showed her completed “Tradewinds” quilt that she made for her son. Rachel showed her Auburn colors “Labyrinth” patterned quilt that is going to be a wedding gift. Lisa showed her Kaffe Fassett global block swap quilt top; a Kaffe Fassett fabric quilt top made with brights and swirled fabric and a stuffed owl in progress for the quilters desktop. Lael showed her “X Marks the Spot” quilt of teal and brights and a Hearts quilt made from a pattern seen in Quilty magazine. March 28- 30- Arly sew down at Lael’s lakehouse. Please coordinate bedding, chairs and tables and food with Lael. April 10-13th- Red Rooster retreat with Elaine and her scrapbooking friends. There are 11 spots still open. The price is $245 and includes food. Please let Elaine know asap. Quilting Retreat for next year- We discussed going to Grand Oaks (between Guntersville and Scottsboro). We can have the weekend of March 13-15. The price is $210 with meals included- check-in on Friday afternoon and checkout Sunday afternoon. Or we could go to Snowbird which is less expensive at $175 and is located in Crane Hill, Al. There are several weekends open there. The feedback was that Grand Oaks was nicer with more comfortable beds. We need to decide soon so we can get on the schedule if we chose to go to Grand Oaks. Library Update- Please bring your quilt(s) for display! It has been well received in the library and what a great way to share our craft and art with the community. Bring your quilts by the next meeting or contact Deb directly. Please fill out the information form located on the facebook page so that we have accurate info about your quilt(s). If you have pictures of it, email to Deb. The next hang date will be after the next meeting in April. If you would like to put your quilt up for sale, the fee for the library is 20% of the sales price. We have gotten a $1000 ladder donated from Werner! We only have to pay the shipping fee of $156 which the library will be paying half if not all of that fee. The ladder will stay at the library. Library Window Display- We have the months of June and July to show our small quilted items like bags, baskets, pot holders, small wall hangings, placemats, etc. Be thinking about what you can share. Modern Quilt Guild Challenge- This will be made from Michael Miller fabrics and Elaine will take the last spot. Jen’s Ugly Fabric Challenge- Jen shared ½ yard of “ugly” fabric for us to work our magic on. We need to have something made from it, preferably quilted, by the meeting in June. There will be two categories- “Everyone’s Favorite” and the “Most Modern”. Charity Quilt Block Update – Lael is working on getting donated materials for our charity quilts and she is collecting the UPC’s from Hobbs batting. We discussed to whom we will donate the quilts and Lisa is going to check into the pediatric cancer center at Huntsville Hospital. Our original idea was to donate to the families of infants in the NICU but apparently the need is being filled for those quilts. Demo sign ups- April- Jen; May- Pat; June- Lael; July- Deb; August-Karen; September- Jan; October- Amanda; and November is open. 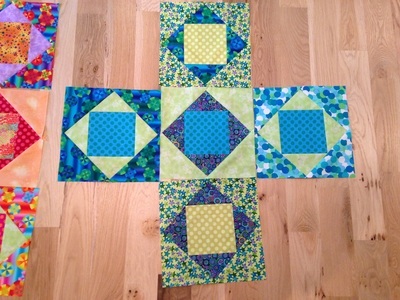 New Charity Block Demo – Lisa showed how to make her Wonky Diamond Block. Please see the facebook page under files to find the tutorial. Due to inclement weather, the February meeting was cancelled. In Attendance: Deb, Lisa, Heather, Rachel, Elaine, Carol, Lael, Jeanette, Karen, Jen, Eli. Elaine showed her Noodlehead tote bag, Sew Together bag (http://www.craftsy.com/pattern/sewing/accessory/sew-together-bag/36309), A Dresden block made from batiks, a Christmas quilt from a block of the month (Fat Quarter Shop), a Scrap Vomit quilt, a quilt patterned after Van Gogh’s Stormy Night using the Storm at Sea pattern. Rachel showed her completed quilt top made from the Bonnie Hunter’s Easy Street pattern. Eli showed her zig-zag quilt made with Pez fabric and Half-moon fabrics. Jan 18th- Rainbow slice blocks (charity blocks). Feb 8th- Fractured Pervalong- this has been rescheduled several times so come on out. Library Update – The quilts are up! There are a total of 16 quilts hanging in the Huntsville Public Library and they look great. We will change up the quilt display every 3 months with the next one going up at the beginning of April. Please look through your quilts that you wouldn’t mind displaying.. Quilts should be no bigger than queen size and no small than about 5’ square. Quilts may be sold if you wish with a 20% consignment fee to the library. Please have a little write up about your quilt with the quilt name, pattern (please attribute copy written patterns to the author), something about the quilt and the quilters’ information. The window display at the library has also been popular and we need small quilted items for this. The display case is about 43” x 76” x 14” deep. 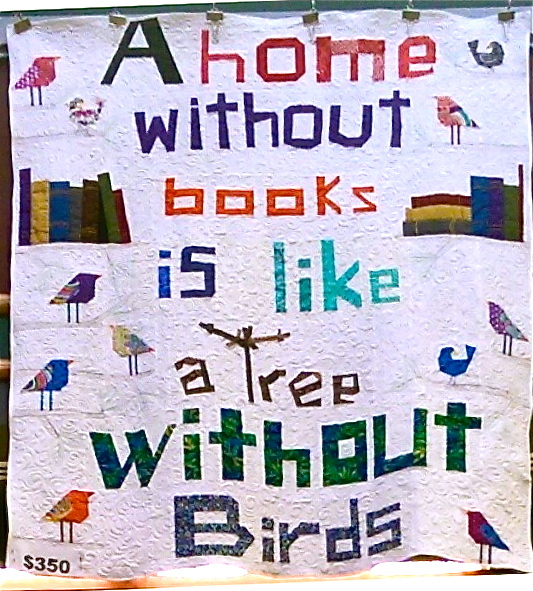 The donation quilt for the library will have the phrase “A home without books is like a tree without birds.” Watch the facebook group for updates. Assignments are due by the next meeting on February 11. Guild Swap- This is a new thing for next year where we will swap a small quilted item or craft. We will postpone this project until later. Charity Quilt Block Update – We are still working on the Rainbow Blocks with a dedicated sewing Saturday on January 18th. We will have a quilt assembly day on March 1st. Guild Block of the Month- Our new block of the month project for this year was designed by Deb. More info and instructions coming soon. In Attendance: Deb, Lisa, Fern, Jan, Karen, Jen, Amanda, Rachel, Lael and a big welcome to our new members, Elaine and Diane. Fern showed a gold tutu she is working on for her church production and a stuffed, 3D Christmas tree. Jen showed her finished Lyn Brown pattern quilt top with a colorful, scrappy look. Lael showed her “Fox Tails” finished quilt that was made from the Zen Chic fabric line and for the quilting, she used a “sketchy boxes” pattern. 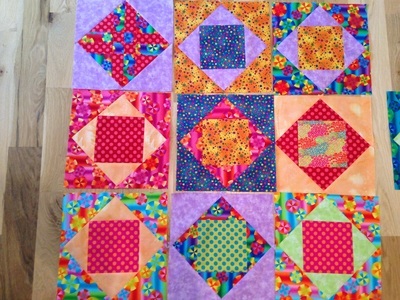 Lisa showed two similar polka dot/brights finished quilts that will be gifts and a baby quilt top. Library Update – After having a meeting with the library representatives, we are back on for displaying quilts. It is still to be decided if we will be using clips or a quilt sleeve. We can begin hanging them on January 6th. Quilts should be no bigger than queen size and no small than about 5’ square. We will be swapping them out every 3 months. Quilts may be sold if you wish with a 20% consignment fee to the library. Please have a little write up about your quilt with the quilt name, pattern (please attribute copywritten patterns to the author), something about the quilt and the quilters’ information. We hope to put together a flyer of some sort with the info about each quilt and info about our guild. The library Christmas tree decorated by our guild is up and looks great and it’s on the 3rd floor. Please go by and vote for our tree! Guild Swap- This is a new thing for next year where we will swap a small quilted item or craft. We will possibly start this in February or March. We will fill out a form in January so bring your ideas. 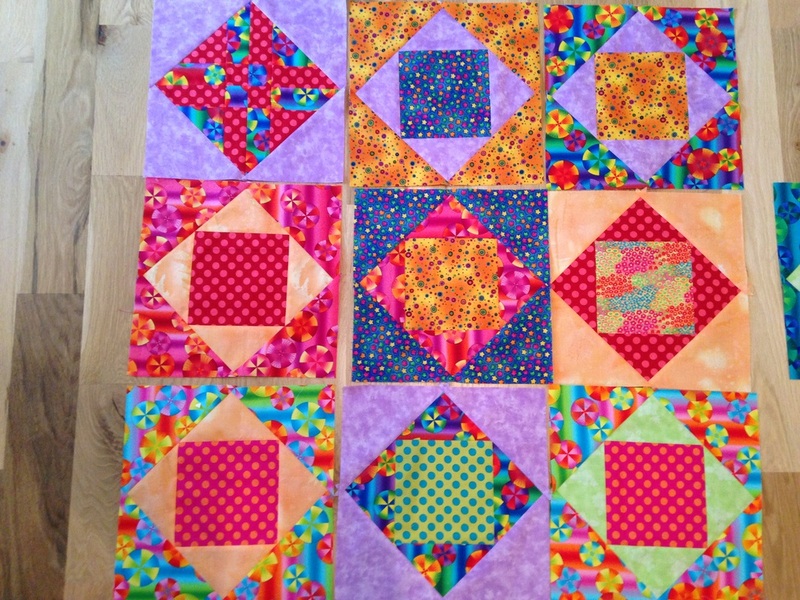 Charity Quilt Block Update – We are still working on the Rainbow Blocks. We will have a quilt assembly day on March 1st. Jan showed her black and red quilt that will be a gift for her daughter in law. Deb showed her wreath quilt that she drew up based on a picture and her snowmen ornaments for the library tree. Rachel showed her black and yellow block of the month quilt that was taught by Fern. Lisa showed two similar polka dot/brights finished quilt tops that will be gifts. Fern showed her wall hanging in progress of a meditation Sri Yantra that is based on a picture. Dec 10- Holiday Party- Bring a $10 gift (wrapped or unwrapped) for Silly Santa Swap and make a small quilted item (in lieu of an ornament). Jan 14- UAH campus reopens on Jan 11. Library Update – The quilt display is on hold for the time being. The library contact person is no longer available and the new person is not keen on us attaching permanent quilt hanging devices. There is a possibility of using the easels to hang smaller quilts like wall hangings. Charity Quilt Block Update – Please bring more Anita’s Arrowhead blocks (quilts will be assembled in the spring). Our new charity blocks are a modern rainbow block. Please see the website and fb for the uploaded PDF instructions. Demo – Jen showed the Magic 9 Patch: The Next Generation. This can be found at LynBrown.com. Next year we will all be able to participate with sharing a demo! A sign up sheet will be available at the next meeting. Be thinking about which month you want to sign up for. No one ran for any position so we took volunteers and twisted arms. President: Deb. Run member meetings, serve as a main point of contact to the national MQG, set goals and provide vision for the guild. Secretary and webmaster- Lisa- Take meeting minutes, type them up and post to the website. Charity Quilt Coordinator- Amanda and Lisa- Select charity blocks, provide instructions, coordinate days to assemble and quilt the donated blocks. Coordinate donations of backing fabric, batting, etc. Photographer- Lael- Take pictures of Show and Tell items and post to the Flckr site. Deb showed her Urban Nine patch quilt top and her “Happy Cows” placemats that she is working on. Lael showed her triathlon quilt with red and aqua crosses. Lisa showed a quilted makeup bag and her finished iron caddy. Fern showed her batik Over the Rainbow quilt top, a rag rug made with fabric scraps and a pulpit cloth quilt that will be hung in her church. Oct 26 – We will be starting the “Fractured Nebula” quilt. The pattern link is on the fb page and on the guild website page. Make sure to bring all your cut foundation pieces and a glue stick. Nov 12 - Guild officer elections (President, VP, secretary and treasurer). You will have to pay your upcoming dues before running for office. If you would like to be an officer, please contact one of the current officers by Nov 4th to be placed on the ballot. A report on the recent Atlanta show was that it was hard to find and the venue it was at was dark and not well lit and had less vendors than before. Oct 10, 11, 12- Birmingham Quilt Expo We have 6 free tickets. We can carpool and share the cost of gas and the extra tickets for those interested in going. Comments from last year’s attendees were that it was a smallish show with not many quilts but did have some good demos and a fair amount of vendors. Oct 11-13- Fanfare Quilt Show in Huntsville at the VBC. Oct 24-26- Blount County Quilt Show at Palisades Park. Library Update – It looks like we will be starting our quilt display in the near future with Christmas/holiday themed quilts. More info to come. If you have a quilt to hang, make sure it has a 4” sleeve on the back. Demo - Deb showed “Mary’s Triangle” or Shaded four patch. There is also a link on fb. Rebecca showed her paper pieced star quilt that was made from a BOM pattern. Her top will be displayed at the HQH quilt show next month. Linda showed two round quilted table toppers and her finished Thangles quilt made in burgundies and beiges. Lisa showed her Christmas Stack n Whack quilt, a double sided quilt with stripes on one side and polka dots on the other; a wedding signature quilt and a pastel log cabin quilt. Lael showed her “Must Have Sushi” quilt that is displayed on the fb header, and she showed her finished Thangles quilt. Dec 10- Holiday Party- Bring a $10 gift (wrapped) for Silly Santa Swap and make a small quilted item (in lieu of an ornament - wrapped or unwrapped to go with the gift). Sep 19-21- The Georgia Quilt Show in Atlanta. Comments from those that have been before were that this is a good show with many quilts. Library Update – We need 5-6 quilts for the library display starting in October. The quilt needs to have a sleeve for hanging and must be at least 5 ft square. They will hang for 6 weeks then we will need 5-6 more holiday themed quilts to hang. Please get your quilt to Eli by the September 21st sewing Saturday. We will have a waiver for you to sign. We discussed making a RCMQG banner type quilt to hang at the library. We talked about it having a rocket and the initials of the guild. Charity Quilt Block Update - We currently have 15 Anita’s Arrowhead blocks. Bag Challenge- We had 4 submissions: A quilted zipper bag made by Lisa, an iron caddy made by Amanda, a sheet music bag made by Fern and a bag for holding rulers and cutting mats designed and made by Deb. The winner was Deb’s bag. Demo - Deb showed her quick curved ruler that she used to make her Urban Nine Patch quilt. There is a pdf file available for the pattern. She showed the finished quilt. The next BOM will begin after the New year. Show and Tell: Jen showed a large quilt that she extensively quilted on her longarm using rulers. She bought the quilt top from ebay. Her second quilt she made using the pattern “Turning 20”. Tammy is working on 2 quilts that she will have ready in October. Rachel showed her king sized quilt top made with modern blocks of grays, neutrals and blues. It was inspired by “City Quilts” and will be a wedding gift. Amber showed her quilted weekender bag that she made using an Amy Butler pattern. Fern showed her free motion quilting samples that she made at the last sewing Saturday. Lisa showed a finished quilt made Kaffe Fassett fabrics and pattern. Heather shared a baby quilt in progress that she is making for her daughter. It is free motion quilted with scallops and made with an Etsy pattern. Nov 12 - Guild officer elections (President, VP, secretary and treasurer). You will have to pay your upcoming dues before running for office. Dec 10- Holiday party where we will have a dirty santa gift swap and also bring a handmade quilted gift for exchange. We discussed the following pros and cons and voted to join the Modern Quilt Guild starting in January 2014. There were 13 out of 17 members present with 12 yeas and 1 nay. Our dues will not be increasing at this time as we have enough money in our account to cover the dues. The MQG has a guild hub for websites. We still need to decide if we want to link our website to theirs or keep our website. Several people agreed to check out their website to see if this would be a good thing for our guild. The CRM system will allow guild leaders the ability to track membership, take payments, communicate with your guild through groups and newsletters, and plan events with RSVPs. In addition, the social media hub will facilitate guild to guild communication for planning meet ups and swaps, share photos of work, ask for advice, and get information about MQG challenges. Alzheimer’s Art Quilt Update - Karen let us know that the mini quilts were received by the AAQ. Charity Quilt Block Update - We currently have 14 Anita’s Arrowhead blocks. We will take as many more as you all make (due at the September meeting) to make as many quilts as we can. Guild Challenge- Any bag, purse, tote that is patchwork, quilted or both. Your project is due at the September meeting. The winner will get a picture posted as a header for our fb page. Upcoming challenge is for the December meeting and will be any patchwork, and/or quilted, holiday/winter themed item. Demo - Deb showed two techniques for quick quarter square triangles. Her feedback was that the method used in the pattern she was testing leaves bias edges that can be problematic. It was very fidgety and she missed a lot points when doing it - so not as accurate. The second method was quicker and no bias edges. She showed the last blocks to finish the series. Instructions will be posted on the fb page. Amanda, Fern, Deb, Amanda, Karen, Eli, Rachel, Lisa, and welcome Jackie and her guest. Fern showed off her Batik Over the Rainbow quilt, her Saucy spiral table runner and showed a picture of her Anita’s Arrowhead quilt that is at the quilters. She also told a story about making kneeling cushions for her church. Deb showed off her Urban Neighborhood quilt in progress. It’s approximately 100” square. Pictures can be found in our Flickr group or on our Photo Album page here. July 13th - Last minute sewing with the focus on a charity quilt for Amanda’s friend. Aug 10 - Free motion quilting workshop. It was suggested by Deb to bring a sheet for fabric backing scraps. She will have a list of supplies in the near future for those participating. There is a lot of interest in the Fractured Pervalong quilt. A date will be decided upon at the next meeting. Sept 10th - Quilted bag challenge will be due. Birmingham Quilt Expo is Oct 10, 11 12. We have 6 free tickets. We can carpool and share the cost of gas and the extra tickets for those interested in going. Eli – We will be displaying 4-6 quilts at a time starting in the fall and rotating them out every couple of months. The guild will be able to pay for the supplies necessary to hang the quilts. The library was very pleased with the window box display that was done. There was also talk of having quilts for sale. The new pattern will be Anita’s Arrowhead in the 12” size. Blocks will be due back in September. Use one solid and one complementing patterned fabric for your blocks. We had enough of the previous charity quilt blocks to make 2 quilt tops. We will have Sewing Saturday for assembling/basting the charity quilts in the spring. Fern gave instructions for her block of the month. It will be wrapping up soon. Fern showed off a yellow compass block that she has been working on and a quilt top she made from a kit salvaged from her mom. Heather showed off her Elizabeth Harmon windows quilt top made with a little red riding hood theme. Rachel showed off her batik lap quilt. It's the biggest adult she has made so fast. Lael showed off her happy caterpillar mini quilt. Deb showed off her Dr. Who, biohazard, owls and wonky houses mini quilts. Amanda showed off her outer space double sided baby quilt. Karen showed off one of her Lord of the Rings blocks from the block of the month she is working on. Thank you for all that loaned quilts for the display. We will be setting up a display again next June. Let’s come up with a great theme and start working on it. The library patrons loved it. We will be making a word quilt for the library. Each person will pick a word and make it - please, solid and mottled blenders only. No prints or calicos. The current donation block is a pinwheel. Some of Amanda's friends made several and mailed them to her to get us started. Color Challenge voting - we had four entries for our first challenge. Heather and Rachel made mini quilts for the Alzheimer Art Quilt Initiative, Fern made a snappy pouch and Karl made a happy sushi quilt top. The group voted and Lael won. Next Challenge - bags. The only requirement is that they include either piecing b patchwork and/or quilting. Deb brought in patterns to look at for inspiration. The bags are due at the September meeting. The dye day has been delayed until fall due to Eli’s work schedule. Karen The Alzheimer Art Quilts are due at the July meeting. to register the quilts. The guild will pay to ship them. We would like to get them sent in by the end of July. The program is over in August. Show and Tell - Lael showed off her heart quilt and a disappearing nine patch. Rebecca showed off her paper pieced compas stars. Fern showed off her green & white quilt (using the donation block tutorial), a Fruits of the Spirit quilt and a Celtic Spin which is the quilt she will be teaching. Library update - still have not come up with a way to hang the quilts. We will work on it. The library is very excited about our collaboration. Thank you for all that loaned quilts for the display. We will be setting up a display again next June. Donation Block quilt - Contact Amanda if you have any more blocks. The next donation block is wonky pinwheels. Amanda gave out the block to those at the meeting. Please make increments of four to assemble the pinwheels. Color Challenge update - Bring your Color Challenge quilts to the June meeting! Next Sewing Saturday - this Saturday, Fern’s wall hanging. The Alzheimer Art Quilts are due at the July meeting. In attendence: Tammy, Jeanette, Deb Rebecca, Linda, Diane, Heather, Fern, Lisa, Eli, Rachel, Amanda and Mary. Plus two guests. 2) Eli showed her quilted stuffed elephant she made with fabric from her old kitchen curtains. She used a “Rumpled Quiltskins” pattern. She also showed her embroidered handbag that she has made with recycled patches. 4) Fern shared her Charity blocks that she made. And she liked the pattern so much she ended up making enough blocks for her own quilt. 5) Lisa shared her finished baby quilt that was made from her own pattern and an almost finished quilt top of “Over the Rainbow” courthouse steps block pattern. 1) Alzheimers mini quilts for donation are due by July’s meeting on July 9th. It’s not too late to make one or two. They should be no larger than 9 x 12 inches completely finished. They must have “quick corners” for hanging. 2) A suggestion was made to make pillowcases for donation for kids with cancer. 3) A ruler and stencil library was discussed where we could lend or donate our own rulers for use by other guild members. A deposit might be required. This would be a great way to try out specialty rulers that we might not otherwise want to buy before trying them out. 4) Dye Day- A future event that Tammy agreed to host at her house and Eli agreed to be the teacher for. The goal is to do this in the next 6 weeks before it gets too hot. More details later. 5) A member database was discussed as a way to share amongst ourselves. We are looking at a “closed document” type setup where only we would be able to access the info. A signup sheet was passed around for those that wish to be included with however much info they would like to share. Amanda is in charge. 6) A pinterest board for our guild is going to be set up by Amanda. This will be a great way for us to “pin” quilting related tutorials and pictures. 7) Our guild color challenge is underway. If you still need color chips, contact Amanda. Bring your creation that includes your 2 colors to the June meeting. We will then vote on the most cool one to be featured on the front of our facebook page. 8) NICU donation quilts. These are the quilts we will be making with the star blocks. We will make and donate as many quilts as we can dependent upon how many blocks we get so keep them coming! We need more cool colors at this point. We are taking donations for quilt backing fabric. These quilts will be donated to parents of a nicu child that was lost. 9) Library Quilts: Eli has had several meetings and explored options for us to display our quilts. It was talked about that we might have a multi-quilt display that would hang. Possibly as many as 30 quilts at a time. We discussed how to hang the quilts and that a small fee per quilt for the hanging supplies might be necessary. We are looking at the fall to begin. Library Display Case: We have a 43” x 76” x 14” deep display case and are looking for smaller quilts, wall hangings and folded quilts to display. We need your things by April 20th. June 8 - open sew - word quilts? June 29 - open sew - winding ways? lone star? Scrap quilt day? giant one block quilts? small projects like table runners/placemats? Please RSVP in the Facebook group to events this way others will know how many are attending. You should also check in before going to make sure others are coming. Deb tries to post sometime during the week before to get an idea of who is or isn’t coming. Let's get the quilt conversations started and continued! Are there suggestions for a quilt that you would like to do as a group? If you would like to loan us a fun, modern quilt - no matter what size it is, please contact a board member. We could really use some small ones. The larger ones will have to be folded so the entire quilt will not be shown. Deb made a Qr Code quilt top that links to the guild website. Fern will quilt it. There is no news on displaying large quilts hanging in the library. The director has been difficult to connect with. Eli is going to follow up with her. Eli has huge visions for the display - among them was making a wire framed tree and hanging small quilts from it like leaves. Please make small quilts to hang in the display! If you do not wish to keep it, it can be donated for the AAQI. Alzheimer Art Quilts - Lael volunteered to register and send in the quilts. The deadline for donating quilts will be July 1. We would love to see every person donate one. They are small - no larger than 9x12. They need to be quilted and bound - with quick corner triangles for hanging. If you finish your small quilts before the library display is set up, they can be used to decorate the display. Amanda gave details for the Color Challenge-- She went to the hardware store and picked up some paint chips for anyone who would like to participate in the color challenge. Bring finished projects to the June meeting for voting/photos. The "winner" will have their project showcased on the front page of the guild website and the facebook group page. *Charity Blocks--Eight point stars for the first blocks, with a deadline for submission May meeting for this block). Deb volunteered to quilt at least one. 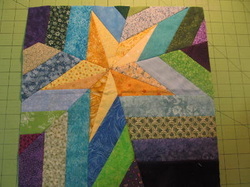 Use bright white as the star/center of the blocks. The guild will purchase the sashing. Use your scraps for the colored parts--The group decided to do a rainbow quilt with each block being different colors instead of just a two color quilt. The quilt(s) will be donated for Lael's charity, giving quilts to parents that lose an infant at the nicu. We briefly spoke about a ruler/book/quilt stencil lending library. The details will need to be worked out on how to lend out - possibly write a check to cover the cost of replacement if they are not returned? We will work on it. Deb - red, black & white Japanese quilt top & Spiderman quilt top that isn't quite done yet. Demo - Fern’s bom plus demo for the double pinwheel. More details of the block will come soon. Present: Lael, Lisa, Amanda, Fern, Jeanette, Tammy, Jan, Karen, Amber, Deb Rachel. If anyone wants to become a member, please see Amanda. Membership cards were distributed. If you have not gotten yours, please see Amanda at the next meeting or Sewing Saturday that she is attending. Show and Tell was done. The next meetings will be on Mar 12 and Apr 9. A discussion for increasing the Sewing Saturdays to every other Saturday was discussed. It was decided to keep it as is for now. An additional Sewing day was added for April 6. Reminder.. if you want to host a sewing group in your home, invite people. You can invite whoever you want or post it openly top the group. Have them as often as you like with as many or as few people as you want. Upcoming ideas for workshops.. qr code, lone star, winding ways or general themes line curves. Nobody had any other suggestions. If you have something on your to do list that you think others might enjoy making, please suggest it for a workshop! Eli was not present to give an update on the Main library display case. If you have a modern quilt or wall hanging that you would like to have displayed, please do! Donations will be accepted through Sewing Saturday, April 20. A date was not set for final donations for the Alzheimer Art Quilt Initiative. It will be soon though as the program ends soon. There was a discussion on other charities. Lael would like to work on quilts for the neo natal units for the families of babies that pass away. Jan pledged to donate a burial gown for all of those quilts that are donated. Lisa volunteered to take over as secretary. All members agreed. There were no other volunteers for board positions. There was a discussion on bringing back the yahoo group to remind people of meetings. email reminder service for meetings & events. It was decided to do a manual mailing list through the group’s email account. Dates for events will be added to the yahoo calendar which will sync with gmail’s calendar. Deb presented a demo of fabric folding and pinning to keep your yardage from turning in to giant ropes in the wash. She brought her folded, pinned, washed and dried fabric with her. There was 9 yards of fabric on it and barely any wrinkles. Fern presented the February block of the month. Paducah – Moors Resort has 7 rooms as of Tuesday and only 2 rooms as of Thursday. The price is 72+ tax. It is ~ 40 minutes from Paducah on Kentucky Lake. A group is leaving Thursday evening and returning Saturday evening. We will look at car pooling up there. Dues of $20 dollars were paid by interested members. If you didn’t bring your dues this meeting, please bring them to the Feb. meeting. By-laws were discussed. There are some grammatical errors that need to be fixed. The by-laws were approved by all members in good standing (those that paid their dues). Junior membership as well as children at sewing Saturdays or Workshops was tabled for a later date to discuss. All members approved opening a bank account at Red Stone Federal Credit Union. In May we will be displaying modern quilts at the library. Eli will lead the effort with Jen and Karen assisting. We will look at displaying the Alzheimer’s quilts and also the name of the club in quilt letters. The display size is 76 x 43h and 16 d. We can also put up quilts in other places in the library. Demo – using washable school glue when binding – no need to pin. Cut the binding 2 ¼ inch if using a quarter inch foot or 2 ½ inches if using a 3/8" walking foot. Iron the binding in half. Sew the binding on the quilt. Flip the binding to the back. Use washable glue on the sewing line, fold down binding and iron with a dry iron. Then on the front side, stitch in the ditch and you will have a nice looking binding. Fern showed the December and 2 blocks for Jan on her BOM. March 23 – open sew – Mar 30 was next open sew however it is Easter weekend. Eli showed the first quilt top she started years ago. She called it “heavy metal log cabin”. Rebecca showed the quilt for her grandson, her long term pink project many of us recognize from sewing Saturdays, a massive blue log cabin quilt for her friend which is the first one she’s ever finished, and an even bigger braided quilt. Lael – showed of her completed “fresh” Spring quilt. Lisa – showed a multi-colored flannel square quilt that she couldn't take off her design wall to come to sewing Saturday last week. We have to do a bit of paperwork to set up as a non-profit organization and we're still looking into what it would take to set up as a social club. The paperwork needs to be done before we can get the bank account. It will cost about $200 to become tax exempt - maybe more. Being careful to do everything we're supposed to so that we will not have issues with taxes, as the Athen's Piece Maker's Quilt Guild recently has. Dues will not be collected until we have our bank account in place. Dues will be $20.00 which is similar to what other groups in the area charge. If you'd like to run for secretary, Vice President or President you are welcome to. Amanda Conger has already been voted in as treasurer for 2013. Elections for 2013 will be held in January. In 2013, we plan to hold elections in November so that the January will be a clean start with offices. Need to focus more on on modern quilting styles and techniques. After the new year, we will start fresh with a driving focus on the modern aspect of quilting. We can use the challenge quilts for donation quilts if you do not like your end result. Workshops will resume in January. Deb proposes that every other sewing Saturday we can have a workshop. We will begin with the kaleidoscope. It will be our second official workshop doing the kaleidoscope quilt. There are many good tutorials online for selecting and calculating how much material you will need. You will need either 4, 6 or 8 repeats depending on the kind you do. Dec 8, Dec 15, Jan 5, Jan 26. Also planning a workshop on word quilts and portrait quilts from the Out of the Box quilt book. It is available on Amazon and in the local library system. See Amazon to get it. Lisa brought a laundry basket of stack & whack quilt examples for us to check out before the workshop next month. Karen's merinques were a big hit! Rachel showed off the coasters she finished at the last Sewing Saturday. Fern showed a charity quilt she top as well asa Garden quilt. Gladys showed her progress on a tradewinds quilt she is working on. Deb showed off the front and backs of the Spiderman quilt she is working on. Amanda showed her Butterfly stack and whack that we are called the evolution of a goldfish. She also showed off a wedding quilt that she's working on. Amanda Conger has offered to be treasurer. She was unanimously voted in. She will be treasurer for the rest of the year and 2013. Elections - there was discussion about the upcoming year for President, Vice President & Secretary. We should have elections in January but for the next year, we will plan to have them in November so that January will be a clean start with offices. Dues - Deb's mother had a suggestion for our $10 to make prorating easier - it would be $1 a month remaining in the year or $10, whichever is less. It was voted and unanimously agreed to change the dues to $12 a year so that prorating is easy, $1 a month. Dues collections will start at the December meeting. Dues will cover the calendar years. Workshops will resume in 2013. If anyone has a project that they'd like to have as a workshop next year, please post pictures in the Facebook group. Deb Will contact Amber about the 2013 calendar for booking the room we currently meet at. Silly/Dirty Santa - bring a wrapped $10 quilt related gift (find great deals to make your $10 go further!) Make a sewn/quilted ornament or decoration to act as a gift tag. She is looking for donations of cut 1" squares or 1 strips of fabric. Color or print does not matter. There will be no demo for December's meeting. Eli's husband will not be able to make our logo. As soon as we create a logo, we can contact Green Pea Press who does tshirts quicker and more accurately than Eli's husband, who is just learning the process. Fern wrote instructions on the board for the block of the month quilt. We are on month 2. Present at the meeting were: Diane, Mary Lou, Rebecca, Karen, Fern, Cassandra, Amanda, Eli, Deb and a new member, Tammy. Show and Tell - Nobody had any finished quilts but we had a lot of tops done! ****Diane showed her boxed illusion quilt and a 3d tree. Several were interested in making it. ****Mary Lou showed her jelly roll race quilt. She had cut the strips in to halves and thirds before sewing them end to end. ****Rebecca showed a long scrappy French braid strip. She is working on a king sized quilt. ****Cassandra showed off a quarter of the quilt that she has been making for her mother in law. ****Deb showed off the frog quilt for her niece's wedding. It was decided to keep the yahoogroup for those that do not wish to use Facebook. At the end of January, all people in that yahoogroup that are not paying members will be removed. Mail Chimp will be used for meeting and event reminders. Please sign up for the email service. That is the official way we are keeping everyone reminded for meetings and events. The group decided that we will begin charging dues in January. The dues will be $10. Heritage Quilters currently charge $35. A bank account will be set up in the next few months. Our dues collected will go towards charitable projects and other things such as business cards for a guild membership card so that members can receive discounts at craft and quilt shops. Eli's husband will make some preliminary sketches for a logo. Along the way from the Birmingham trip, the group in Deb's car discussed getting tshirts made for the group and loved the motto "Bringing Quilting Back from the Dead" and all loved the idea of skeletons, zombies, etc. At the meeting it was also suggested and liked that a hand can be coming out of the ground, grasping a quilt in front of a tombstone with a sewing machine on it. We'll use the logo for the website, tshirts, etc. Eli said that it would be best to supply your own tshirts and he can do runs with as few as 4 shirts at a time. Cass suggested we use Vista Print for our guild membership cards. It is $10 for 250 cards. We can use the logo that Eli's husband designs or use a generic one from their site. We will work on membership cards and have them (hopefully) ready by January. Deb did a demo of ruler folding fabric and a very basic run down of how she made her mock orange peel quilt. She will come up with a detailed tutorial to put on her website later this month. There was no volunteer for November demo. Fern gave instructions for the first instalment of the beginner block of the month quilt. December meeting will be Dec 4. We will have a holiday/winter party. It was agreed to do the same thing as last year - potluck snacks and a silly/dirty santa? It is a $10 quilt related gift - rulers, fabric, books, etc and a handmade ornament. Please wrap the gift and put the ornament on top. Beginning in October, there will be more Sewing Saturday dates added to -prepare for the holidays. It was decided to do 2 Saturdays on, one off. Dates will be added shortly. The group decided that people should attend 3 meetings or Sewing Saturdays before being allowed to join the group. Someone must become a friend of someone already in the group. The group is "secret" which means that only the people in the group can see who is in it or see discussions going on. The members discussed options for replacing the yahoo group, which a lot of members have had problems with accessing. It was decided to go with Mail Chimp, a free email service. It was decided that reminders will be sent out a week before an event then the day before. A message informing the group that the minutes were updated on the website will also go through. It was also decided that people can receive reminders for 6 months before being removed from the email list. Eli will be handling the membership information. Karen will be handling the Mail Chimp reminder service - update - the email service is up and running. The yahoo group will be disbanded. A message will go out once the Mail Chimp account is set up. The guild members also discussed the possibility of beginning to charge dues. Nothing was decided on the issue. It was reported that the Heritage Quilters now charge $35 a year to join. Opening up a bank account and becoming a non profit group will be looked in to. The annual dues amount was not decided on. Brochures were handed out for the Quilt/Sewing Expo will be in Birmingham on Sept 20-22. We will caravan, meeting at 8am in the Madison Target parking lot. Cass has 2 more seats in her car. Deb has one more seat in her car. There was no demo today however Lisa and Diane both brought free goodies to pass around that were given to them. 1 Dark color - 1 1/4 yard. There will be 20 blocks and they are 12.5" unfinished blocks. It will make a large lap quilt. The Sept 7th meeting is a very important one! Discussion has begun about disbanding the yahoo group and moving it to google groups or to an announcement only email service. We will also discussing whether to use Flickr or Picassa for our members to post pictures of their finished or in progress quilts. Attending - Cass, Healther, MaryLou, Lisa, Lael, Galdys, Fern, Jeanette, Karen, Deb, Amber, Jen Introductions - 2 new members joined - Amanda who goes by Ms. Dragon on line and Rachel - welcome to the group! Show and Tell - Fern, Gladys, Lael, Lisa, MaryLou and Deb - Please post pictures of your show and tell quilts on either the facebook group or the new Flickr pool. Sewing Saturday Aug 25 - Over the Rainbow Boxy Quilt Workshop by Lisa - This has been postponed to Feb. The Aug 25th Sewing Saturday will be work on anything. Sept 15 - Jelly Roll Race Challenge - kick up the Jelly Roll Race quilt. Think of your ideas of what you would like to do to your quilt to add interest. There will be a prize for most interesting quilt. - Do we have someone who wants to bring a prize? We scheduled for Nov 17, Dec 8. School will be closed on and Dec 29 so if we have it it will have to be somewhere else or just not have one that day. Anyone else interested in a Aug 29th sewing, please contact Deb. Do we want to add additional Sewing Saturdays before the holidays to help people get their holiday projects done? I think everyone agreed to have a couple additional Sewing Saturdays. Small home sewing groups - Fern volunteered at her house since she can host upwards of 3 or 4 people. Jen offered to let anyone with interest in longarming to come to her house and she will show them how to use the machine. If you have any interest, please contact either Fern or Jen. Quilt guild Open to Public Yard Sale - need a volunteer to organize it including getting a location, advertising it, etc. Need a date to have it. - Fern volunteered her house. Jennifer looked into Huntsville Community Centers; however, they require a license and liability insurance. Jennifer will continue to look at places and will provide an update. Someone needs to volunteer to put together the Alzheimer Art Quilts and organize another sew day if there is enough interest. Are there any volunteers. Mystery Quilt - Deb doesn't have time to develop one. Fern is looking into doing one similar to one she ran in Korea. Deb did a demo of paper piecing using Lapel Stick, which was the free product give away. A tutorial is available on her personal website. Show and Tell – Linda showed a baby quilt with frogs quilted in the design. 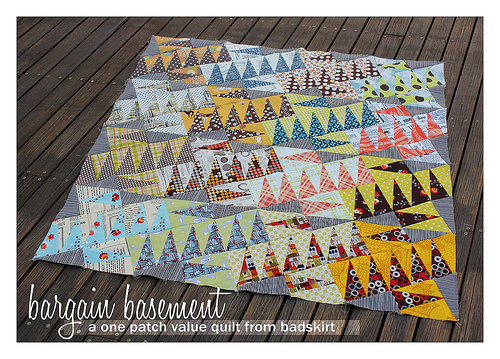 Lael showed her disappearing nine patch quilt. Fern showed her quilt with piping in it and the quilting challenges the piping caused. Lisa showed off the progress on her stripey quilt. It is a quilt as you go project. Diane showed off her spool & star quilt top. She also showed a mini stained glass quilt for a swap in another group. She also showed off her Elvis quilt. Deb showed off a star block that was foundation pieced. There is a lot of interest in having a workshop on it. It was decided that we would do it this coming Saturday. Wilson's in Boaz is having a huge sale July 13-15. July 14 – Star block led by Deb and it's Christmas in July. We are also having our first guild yard sale that day. It will be one to not miss! ***for the yard sale, Please have your items measured(if they are precut), priced and notated if they are prewashed. The next monthly meeting is Aug 7. Deb talked about the Jelly Roll Race Quilt aka the lasagna quilt or the 1600 quilt. An email was sent out through the yahoogroup with links to less scrappy & chaotic versions of the quilt. We also discussed making the quilt larger. It looks like the equivalent of 4 jelly roll packs would be needed to make a top 96 x 120. Someone online used this quilt as a quilt backing. Show and tell – Carol Dock BOM by Deb and Jeanette. Amber showed off her modern quilt strips summer quilt sampler from swim bike quilt. Eli showed her original diamond patterned quilt. Lael showed off her long arm quilting skills on her 2 lawn chair quilts. Fern showed off a kid block quilt to be donated to the Huntsville Heritage Quilts charity that they support. She also showed off her star quilt. Lisa showed off her flannel quilt made with multiples of squares, her stack and whack from her quilt class (if you missed it – it was a GREAT class, and her “Over the Rainbow” Kona cotton log cabin. She will be teaching this class some time later this summer, so be collecting some 2 inch strips of solids. Diane Lowe discussed the TN Valley Quilters Association Spring Seminar June 29, 2012 in Murfreesboro, TN. She is looking for someone from our guild to teach a modern quilt class. The group voted to have the next monthly meeting on July 10 due to the July 4th holiday. At the July 14th, bring a quilt, table runner, wall hanging, tree skirt for Christmas and get started on it. This will encourage everyone to get started early on their Christmas project and hopefully finish it up before Christmas. Do you have fabric that you don’t like any more, or if you are like me you just have way to much fabric, bring it July 14th and either swap or sell it to other members. Please have it all priced! Oops@ We're missing the meeting minutes for March - May. I swear that we had meetings - and really good ones! We're going to try and locate them and get them up. Meeting was held Tuesday Feb. 7th at 6 pm at UAH Morton Hall room 204. First order of business was Show and Tell. Several ladies showed the quilts that they had finished or working on including an African fabric quilt, a modern quilt with hand quilting, Thangles buck a block Jan and Feb blocks, paper pieced trees and fruits, a modern wonky star, a Korean block exchange, and a sampler quilt from www.fabshohop.com . Lisa Hardy showed her Stack and Whack quilt. It looks like there is enough interest that we will have a class. Lisa is looking at her schedule to determine a good day. We voted to keep the meeting on the 1st Tuesday night of the month at 6 pm. Sewing Saturdays are scheduled every 3 weeks. We had a free sew this past Saturday, Feb. 4th. The following are the schedule dates and project classes will start at 9 am. We will meet at UAH Morton Hall Room 204. Some Saturdays will be a project class; however, if you are not interested in the project, you can bring the quilts you are working on. Feb 18th – Kool Kaleidoscopes quilt by Ricky Timms – Deb is teaching this class. Have your strips ready to go before the class. March 31 Alzheimer’s Quilt – We are looking at quilters to demonstrate a technique with a 15 minutes time frame. Jen will be showing how to paint on a quilt. We are looking for those that do bead work, machines fancy stitches, or hand stitches for short demos. Lisa will be scheduling her Stack and Whack. 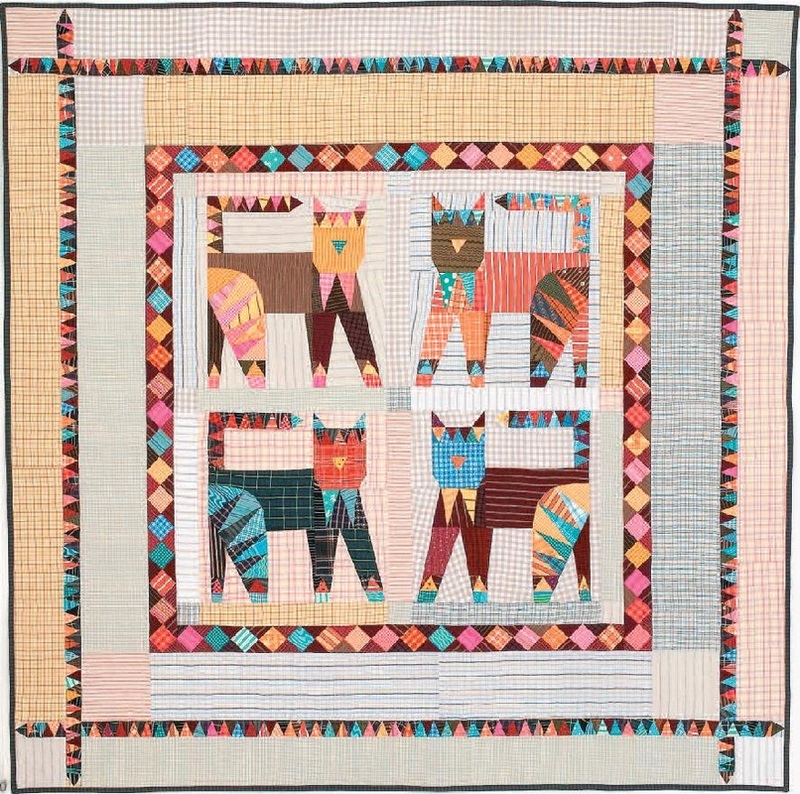 Jen has a paper pieced cat quilt she would like to do a class on. See picture next page. If you are interested in the class, let Jen know. We continue to look for quilt workshops and someone to teach them. So if you have a favorite technique, please volunteer. On March 17th a group will be heading to Decherd TN which is 90 minutes up the road. They are going to Decherds Needlework 300 E Main St in Decherd (931-968-0808). They have quilting fabric for ~ 5.20 per yard, needlework, and yarn. Please contact Deb Richey if you are interested. It has been a year since we have the Modern Quilt group has formed and our group has gone from 4 to 14 quilters at are our last meeting. If you run into a quilter, please invite them to our meetings. Even if you are not in too modern quilts, we want you to join. We exchanged pizza boxes and passed around a pattern that has skill building blocks. If you have interest in participating, let Deb know at the next meeting. There is a group going to Paducah Friday April 27 and returning Sunday April 29th. Contact Jen or Deb for information. Lisa Hardy demonstrated how to quickly piece a flying geese block. These are great for star quilts. New Members: Angel Atkinson, Eli Kadish, Melissa Labella - Welcome!!! Huntsville Sew and Vac has offered to do the Thangles buck a block starting in January. 4 color combinations were shown and everyone who was interested placed their name on the list. Demonstration by Fern – how to make an easy pot holder or coaster called the Criss-Cross - the tutorial can be found here... To make the potholders, use batting and/or insulbrite and change the size to 8"
Discussed doing the Alzheimer’s quilt – it is a 9x12 art quilt with triangles on each corner to hang. These quilts are sold and money donated to research. We are looking doing this by March and sending them out in April. Free quit Jan 21st at Deb Richey’s club house. Need to bring name tags to the Feb meeting. It will be held at Deb’s subdivision club house starting around 9 am. Deb will open up the club house at 8 am. You will need to put together strip sets. Strip sets should compose of several strips of fabric anywhere from 1 ½ inches to 2 ½ inches. The strips on each end should be around 3 inches to make it easier to piece. These strips should be the length of the fabric ~ 42 inches. Each strip set should be at least 10 inches long. You will need ~ 4 to 6 of these strips sets depending on how large of a kaleidoscope you would like to make. 5 strip sets will make a kaleidoscope of ~ 30 inches and 6 strips will be around 36 inches. Deb recommends making one additional strip set since you may not like how one of the strip sets fits into the kaleidoscope. Use mostly solids since if you use a patterned fabric you may need to match the pattern. Fabric strips should have more of a color wash affect unless you like strong contrast between parts of the kaleidoscope. Bring a design wall and freezer paper. We had a Dirty Santa exchange & snacked on great food that members brought. The Ricky Timms Kool Kaleidoscope quilt will be canceled due to Deb listing her house early. It will be rescheduled. Showed off pizza box quilts and exchanged them among members. You can join at any time. The meetings will be held at Huntsville Sew & Vac after the new year. The Thangles Buck a Block will also begin after the new year. Linda did a great tutorial on how to make a Cathedral Window xmas ornament or pin cushion. There will be no tutorial in December due to the theme of the night. December 6th's meeting will be a party. Silly Santa - bring a $10 QUILT RELATED and not gag gift to the meeting. Also, make a Christmas ornament as a tag. The ornament must stay with the gift when it is swapped around. To make it more fun, there will be no limit to the number of times a package can travel around the room. Look at moving the monthly meeting to the Huntsville Sew and Vac. They have volunteered to allow us to hold our meetings there and also monthly programs. Huntsville Sew and Vac has offered to do the Thangles buck a block starting in January. We recommended a jewel tone and fall colors as the 2 types of kits. They will also offer the finishing kit. This Saturday is a free sew at Deb’s club house. Bring your quilting projects. Dec. 10th is the next free sew at Deb’s club house. She needs at least 3 people to make it worth while. Couple of us were interested in going to Paducah. Those that are interested please contact Deb or Jennifer about going. We would spend one night close to Paducah. We will need to make reservations now to ensure that we are within 45 minutes of Paducah. Dec. is dirty Santa gifts. Please spend from $8 to 10 on a quilt related gift and wrap it. We are looking a putting a quilted ornament on the gift. Please no gag gifts. Alzheimer’s quilt – it is a 9x12 art quilt with triangles on each corner to hang. These quilts are sold and money donated to research. We are looking doing this by March and sending them out in April. Jan we are doing a quilt materials swap where we bring in items we want to sell. Items will be sold to each other. So bring items you don’t want anymore. Demo – Jan demonstrated how to do a puzzle quilt. Deb demonstrated how to rip out seams easily. TeResa gave a Thangles demo. Thangles are a quick, easy and accurate way to make half square triangles. Linda brought in a Buck a Block quilt made with Thangles. Several people expressed an interest in doing a Buck a Block project. Deb did contact Quilter's Combo (who still have not replied) and Huntsville Sew & Vac about sponsoring the project. HS&V contacted her and they will be happy to begin this one. Having done research on the BaB quilt - it looks like they begin in May. I'm not sure if we'll be able to offer this until May. New info will be updated when we hear about it. The group spoke of changing the name of the group to something new as the majority of quilters are not "modern" quilters. We have a great group and would love to keep it that way :) The group decided to keep it as is. Ricky Timm's Kool Kaleidoscope quilt will be on November 12. This will be a large wall hanging. I will also alter it to make it a smaller table topper for those looking for a quicker project :) Details will be posted soon. Strips and Curves workshop! This was a huge success! We made a Strips and Curves wall quilt. Held in Deb's neighborhood's clubhouse. Deb (me) attempted to give a demo of the Lazy and Lovin' It book & Ruler but totally flubbed it. Seriously, it isn't that difficult. I don't know where my brain was. We saw some great show and tell. These pizza box quilts are going to be fabulous! Reminder - Sewing Saturday is Saturday, Aug 6. Contact Deb for directions. We will do it again if you are unable to make it. The group talked about doing a project together at a Sewing Saturday. Everyone will make the same project but in their colors. A photo folder has been added to the yahoo group for everyone to add pictures of possible projects they would like to do together. We will discuss it in the yahoo group and set the first one for sometime in September. We had some new faces! Welcome!! Show and tell was awesome. Get quilting - we have been getting some awesome inspiration! We had two amazing zentangle quilts brought in and a few other quilts as well. Some gorgeous stuff! Deb gave a demonstration on using the Anima's Binding Miter Tool. You can purchase it at any local quilt or sewing shop - try to support local instead of buying online. It will be cheaper than paying for it with shipping too. Karen is going to follow up on making quilts for the local veteran's hospital. We will also be making some for the new one that is opening up soon. More information will be coming for that. The requested quilt size is 60x90 to fit an xlong twin bed which is what the hospital has. Lael is going to look in to having the group meet at her office. On the rare occasion that her meeting room is unavailable we can meet at the library. I do urge everyone to check their email or this website to see if there are any issues. I believe we will have more time in advance if we have to relocate at Lael's office. We have been very grateful for S&R to host our meetings but they do have to stay open very late for us to be there. It will be best to move to a new location. It was voted and passed that we will be meeting at 7pm for future meetings. Would you like to join or host a sewing group? Let's get them going!! A road trip was suggested for the upcoming Knoxville Quilt Show in July. Our first meeting was successful! We had a great group of women of all quilting levels attend the meeting. We would like to thank S&R Sewing for allowing us to meet in their store. We really do appreciate their generosity. They are a wonderful group of people and have a very nice store - check it out during work hours! We spoke of charity options - The pillowcase challenge and the Downy Quilt for Kids are the ones that the board suggested. No dues will be paid until at least May. We would like to get the guild up and running completely before we ask for dues. The idea of a quilt retreat was well received. We will look in to location options and report back at a future meeting. We would like to find a nice place that is as affordable as possible. Make yourself a name badge :) Make it in any way that you would like. Express yourself! This is a group project. You will gather together fabric - either 1 yard of one or 1/2 yard each of two to be used as your focal fabrics. You will submit a theme ie trees, wonky log cabins, birds, bento box, whatever you would like. Include a small journal. Put it all inside of a pizza box and it will travel from person to person. Each month, a new person will get your box and will create for you a 10 1/2" block(10" finished) or four 5 1/2" blocks (5" finished) or two 5 1/2 x 10" strips (5x10 finished). When your pizza box is finished traveling, you will get it back, make it in to a wall hanging, table runners, place mats, a lap quilt, etc - whatever you would like to make with them - but please make something and bring it back! When you get someone else's box of goodies, you will create the required block for them, using the fabric provided as the main fabric. You will need to use some of your own fabrics to supplement it - back ground material, etc. Challenge yourself. Do your best. Most of all have fun with it.